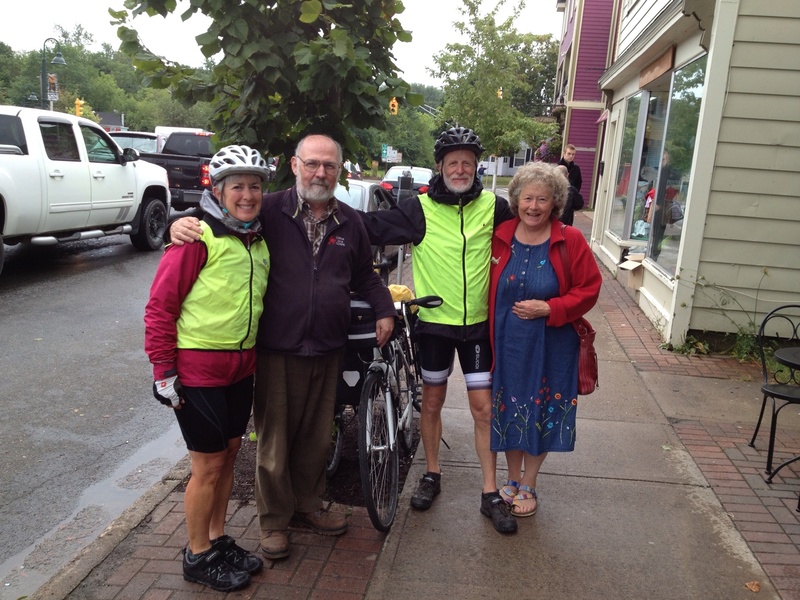 We very gratefully accepted a lift back to Antigonish (with our bikes in an attached trailer), where John and Alison were making a regular visit to the Saturday Farmer’s Market. We all had breakfast at Tall and Small before we headed out. 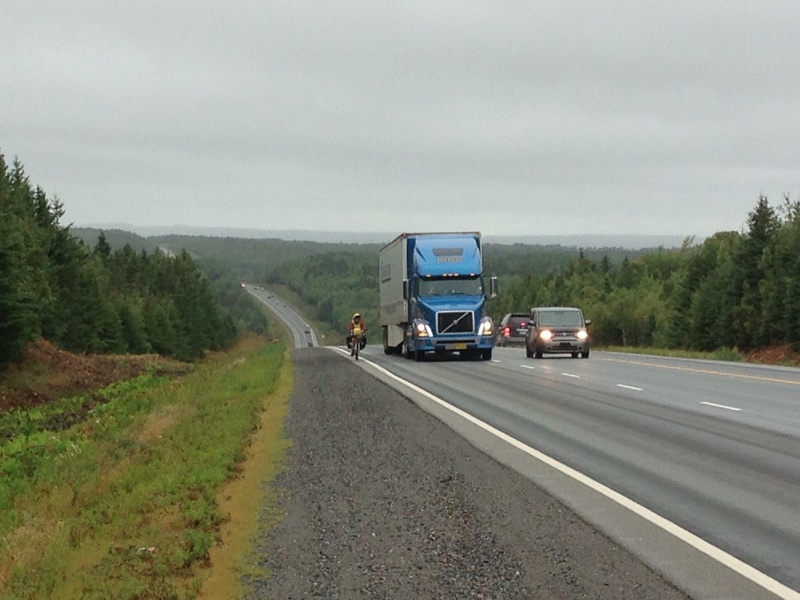 Highway #4 offered a quiet and very enjoyable alternative to the TCH for most of the way to the Canso Causeway. A cyclist from the UK, who had ridden from Victoria via Prince Rupert, overtook us and we chatted while on the TCH stretch. The sun came out and we ate our lunch sitting on a beach looking out into Havre Boucher. 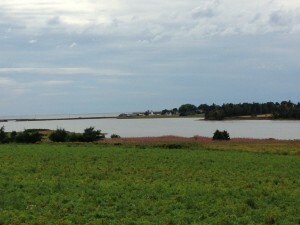 Just before Cape Breton, we rejoined the TCH and crossed the Causeway. As we were stopped to look at the locks, a wedding party arrived for photos, the men all in kilts. The mother of the bride stopped traffic in both directions so that they could go to a suitable scenic spot across the road and which enabled us to easily cross back into the lane going east! We arrived at our bed and breakfast overlooking Port Hawkesbury Harbour and enjoyed the views in the late afternoon sunshine. In two days, we will be on the ferry to Newfoundland, with only another two days of cycling after that to St. John’s. This adventure is rapidly coming to an end! Notes on Port Hawkesbury: The port is the second largest by tonnage in Canada, due to large volumes of crushed rock and gravel and oil trans-shipments. 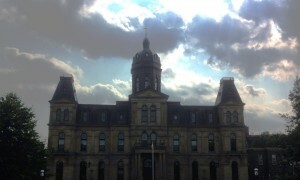 It is also the hometown of Lynn Coady, one of Lois’ favourite authors. We are on the traditional territory of the Mi’kmaq People, specifically the District of Onamag. We passed through the community of Paq’tnkek. It poured with rain overnight and was cloudy when we left the B&B. The forecast was still for strong blustery winds, but now from the north. 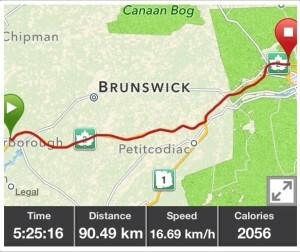 After espresso and a latte at the Baked Goods Cafe, we took the #4 for a few peaceful kilometres before joining the TCH. It started to rain and this continued for the rest of the day. As we climbed, it grew mistier. There were strong gusts, but, fortunately, the wind was either from the side or at our backs, although it occasionally felt as though our bikes would slide out from under us. The road was busy and the hard shoulder disappeared each time there were two lanes in our direction, on the hills, which were frequent. 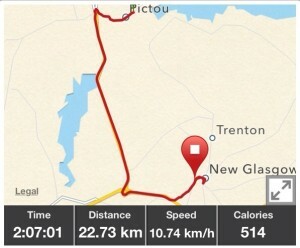 This was not a pleasant ride! But, today we met Ivan #2. 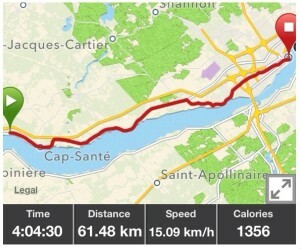 He is from Gatineau and had ridden from there to St John’s five times. 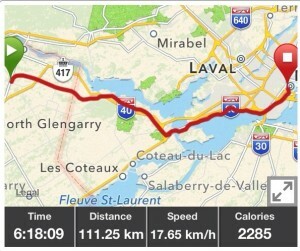 This year, he had taken the train to Vancouver, cycled to St John’s, and was on his way back to Gatineau! 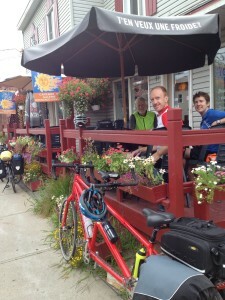 We descended into Antigonish seeking shelter in the Tall and Small Cafe. John met and transported us to his and Alison’s home above Lochaber Lake, south of the town. (Yes, all our friends are named John!) We were greeted by wonderful hospitality and conversation ranging from history to politics as well as chickens and local porcupines. It cleared during the night and the stars were spectacular. 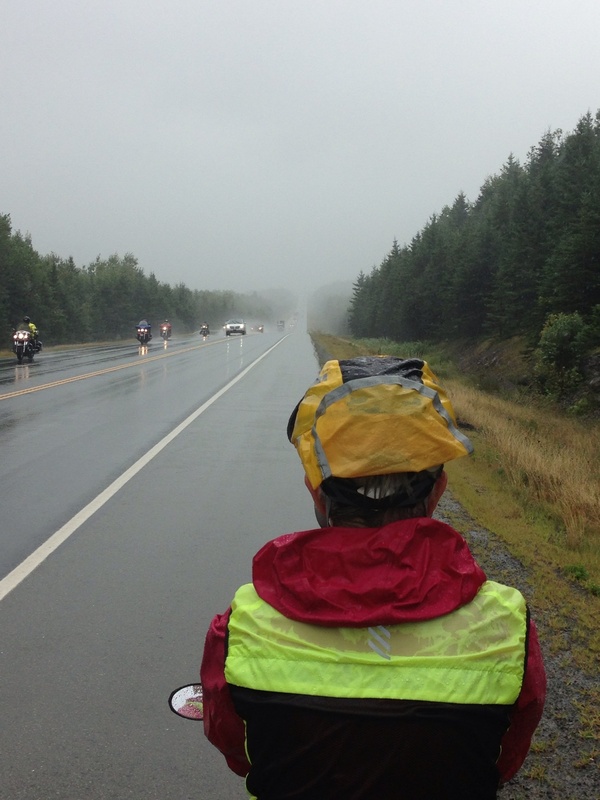 We knew that the forecast was not good as we headed south across the Pictou Causeway. 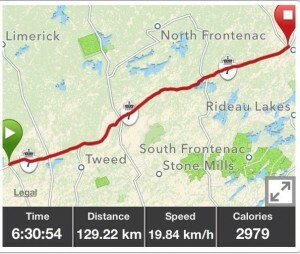 Although the wind was behind us and it was not yet raining when we joined the TCH, we got an idea of the headwinds to come when we would turn east. Stopping for coffee in New Glasgow, we reassessed our plans and decided to stop for the day. The outlook was still for rain with an easterly wind of 25 km/hr, gusting to 38. 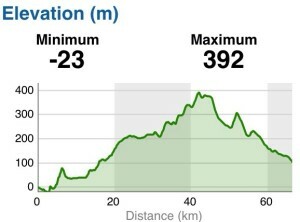 Tomorrow looks somewhat better (still rain, but north winds) and we will not have so far to go to Antigonish. We were intending to stay there for two nights visiting friends, so unfortunately that will be curtailed. It has rained continuously since we stopped and a heavy rainfall warning is in effect for Antigonish, so it was a good decision. Fortunately, we found a B&B single suite above a bistro, so we don’t need to venture out very far for dinner! To our surprise, we discovered that our B&B offers a free laundry service! With that chore gratefully delegated, our first stop this morning was MacQueen’s Bicycle shop. The tires on both bikes are showing the wear of nearly 7000 km, but the rear tire on Lois’ bike looks particularly ripped up. We got advice and decided to return tomorrow morning to replace at least that tire. We then headed back to Terre Rouge (we had a great dinner there last night) for espresso/latte and to finish yesterday’s blog. 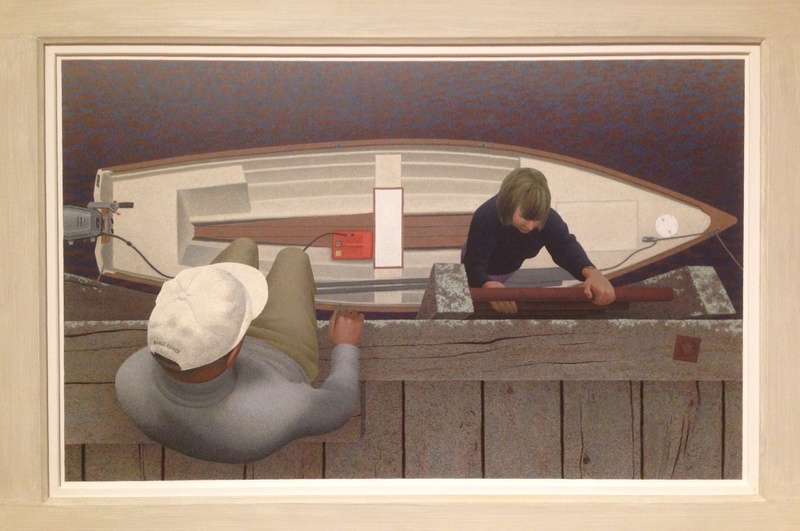 The rest of the day was spent visiting the Confederation Centre Art Gallery – there was a moving exhibit of Mi’kmaq history and culture presented by the Mi’kmaq Confederacy of PEI, an interesting exhibition of paintings by Montreal artist Philip Delisle, and a retrospective of the work of Hilda Woolnough – walking along the seaside boardwalk, lingering over lunch and slowly making our way back to the B&B for a rest and a jacuzzi, before venturing out again for a seafood dinner at Claddagh Oyster House, followed by desert and coffee upstairs at the Olde Dublin Pub, while listening to live music (Richard Wood and Gordon Belsher). It was a good day! Port Elgin to Charlottetown, P.E.I. 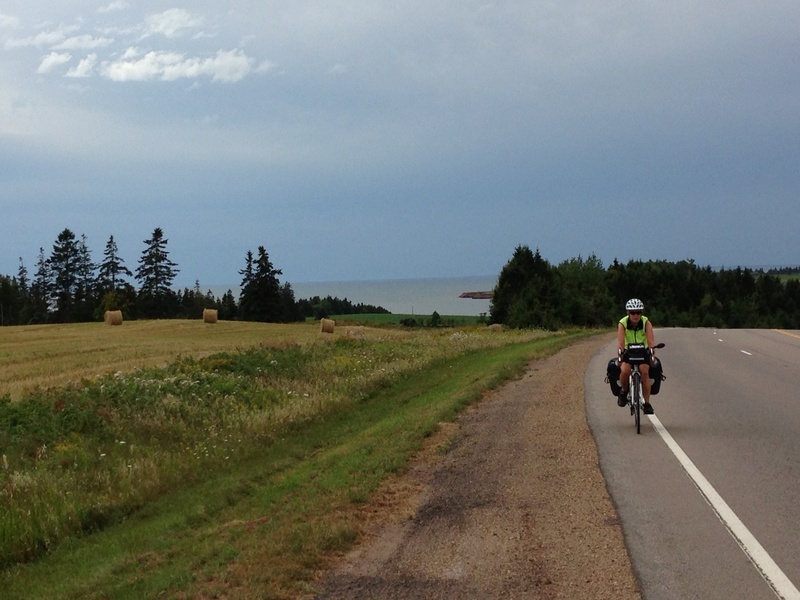 With the wind behind us, we sped east along the TransCanada to Cape Jourimain and the Confederation Bridge. On the way, just after passing a large sign and flashing yellow lights warning about moose, we had to pass one on the shoulder, that must have been hit during the night. The vehicle was not there, but bits of plastic, glass and radiator fluid remained on the road. It was sad that this was the only moose we have seen in the east. 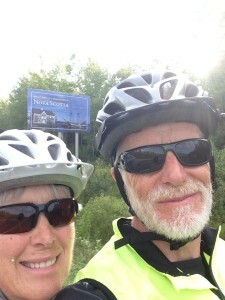 The wait for the required shuttle across the 12.9 km bridge to Prince Edward Island was less that 30 mins and, with our bikes suitably tied down onto a trailer, we crossed into our 8th province. It was our first time on the Confederation Bridge, opened in 1997. Unfortunately, we missed the welcome sign as it was on the part of the highway that was inaccessible to us. The weather was increasingly grey and close and we had to put on our raincoats just out of Charlottetown. 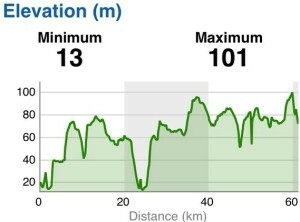 The road was OK but certainly hillier than we had remembered! 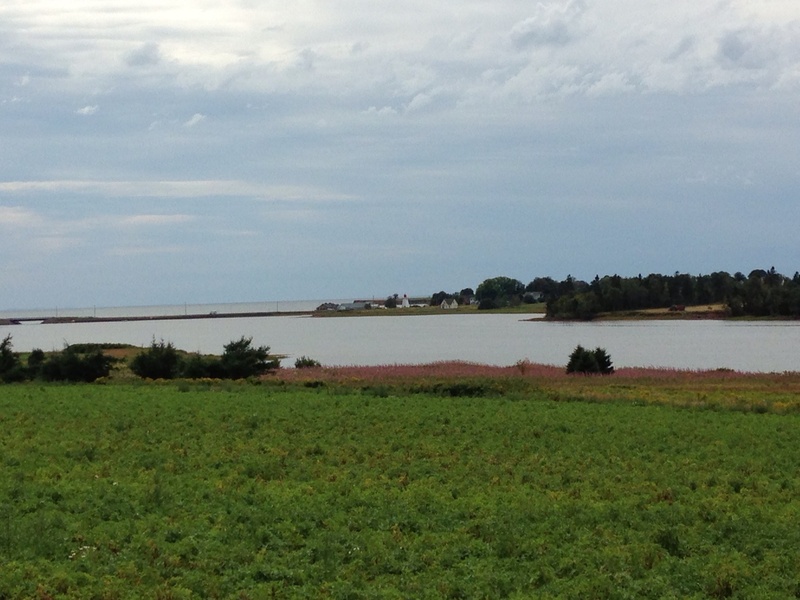 We had some views of the sea and coast across fields of potatoes, wheat and oats. 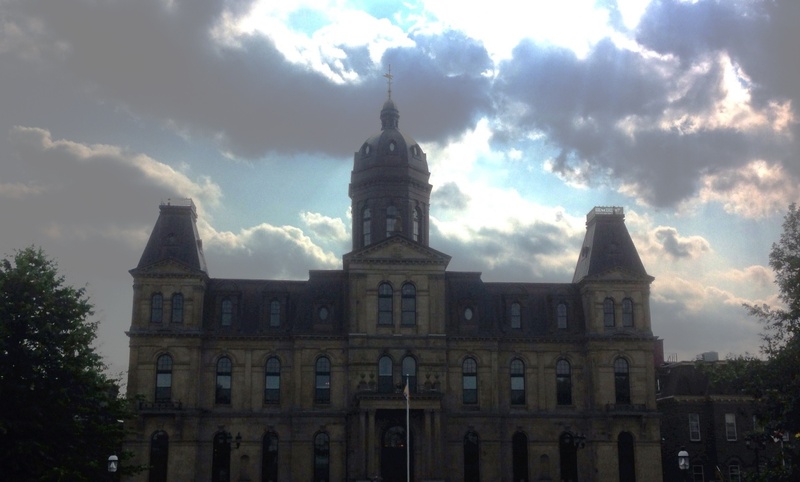 We are taking a day off to explore the provincial capital. We carried on along the #133, turning onto the #950 to view a very crowded Aboiteau beach from the sand dunes. 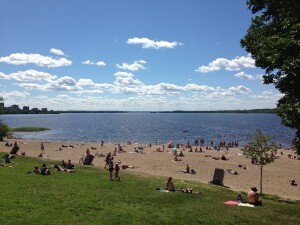 It looked inviting, but it was now mid-afternoon and we still had 30 km to cycle. 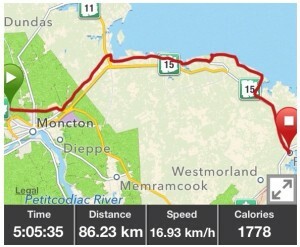 We continued along the #950, through Cap-Pelé “Au Coeur de l’Acadie”. There were many fish-processing plants on the shore, producing smoked herring. We are staying the night in a lovely Victorian B&B in Port Elgin. Dinner was fish burgers in the local (and only) diner. Tomorrow, we go to PEI. P.S. We have added more pictures of Jasper to the Alberta photo gallery, courtesy of Lorraine and Norm, who provided some wonderful action shots! We are now on the traditional territory of Mi’kmaq People, specifically the Epegoitnag District. It was 8 C when we woke up this morning. Under a clear blue sky, we rejoined the #2, which seemed to have been rolled out onto the landscape into the distance. 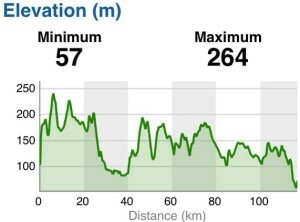 Although the undulating terrain and excellent road conditions made for relatively easy riding, it is less interesting than the old highways, but quicker. 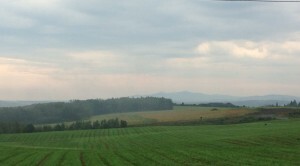 The countryside is mostly mixed forest, much of it previously logged, and some farmland. The highway has extensive wildlife fences, with one-way gates for exiting moose. There was no junction or service station for about 50 km, so we made espresso beside the 4-laned highway and later, had a roadside picnic of cheese, oatcakes and fruit. A sign broadcasting Irving’s environmental contribution by planting enough trees to circle the globe each year was in contrast to the ever present Irving gas stations in the Maritimes. We had a good meal at the Old Triangle Irish Alehouse, which included Picaroons Ale and also bread pudding with Irish Whiskey, while listening to some local musicians and singers jamming. When our taxi came to pick us up, we asked the driver if he would drive along the waterfront. 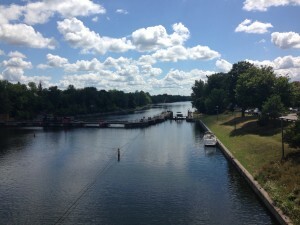 He took us down to the river and suggested we walk along the boardwalk path and he would pick us up further down. The Petitcodiac River was ebbing fast in the evening light. The height of the tide was evident from the wet mud banks. 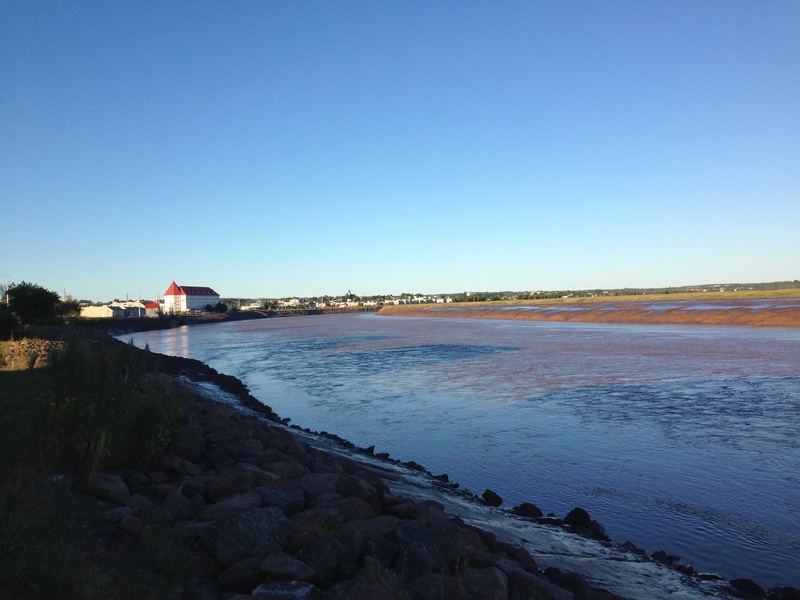 There is a tidal bore which before the construction of a causeway in 1968, was one of the world’s largest. The causeway gates were opened in 2010 and the ocean silt is now being flushed away. The bore is gradually returning to its former heights. Our taxi driver continued to provide a quick tour of the city on the way back our hotel, while giving us some insight into the history of Moncton as well as the local motorcycle culture. Floral Notes: We remarked on flowering wood anenomes in Ontario – in New Brunswick we are seeing the berries. The seasons move along. We remain on the traditional territory of the Malécite People. You can see these lands on a map here. We will again start by talking about coffee. Jonnie Java is a roastery and their espresso is one of the best that we have tasted across the country. We sampled the brew yesterday and came back for more this morning. 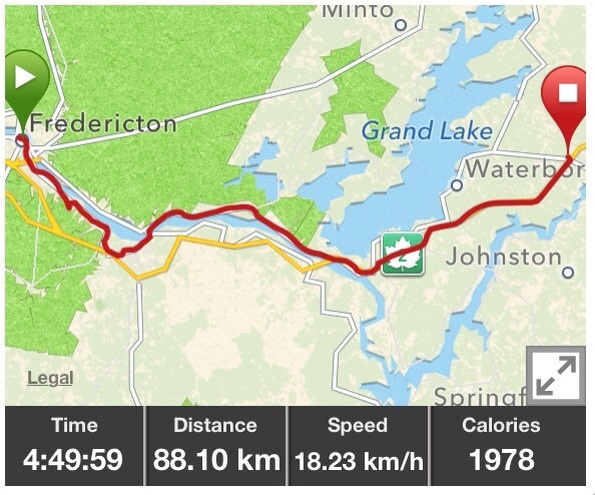 Appropriately caffeinated and armed with sandwiches from the Happy Baker, we left Fredericton by the bike trail along the St. John River, passing some fine houses overlooking the water. The Trans Canada Trail was fine for a few kilometres and then got too rough, so we switched to the #102 to Oromocto. This was only a small village until CFB Gagetown opened nearby. 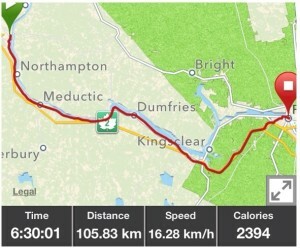 Crossing the river, we joined the #105 for a lovely jaunt along the water, passing Maugerville and Sheffield. 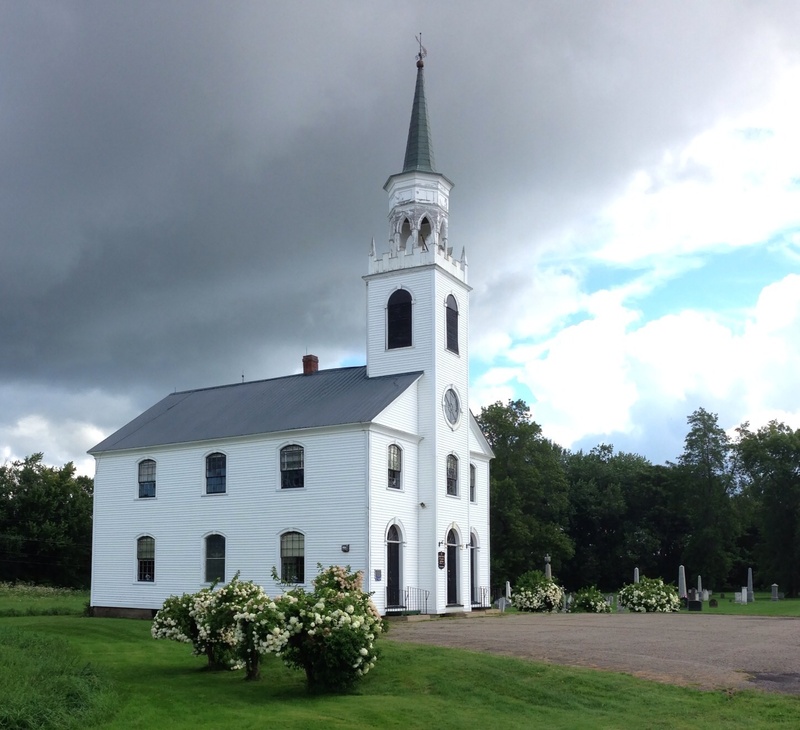 Puritan settlers arrived here in 1773 and set up New Brunswick’s first Protestant church. The present building was constructed in 1840. Highway #2 was never far away and served us for the last 30 kms. We are staying at a truck stop, McCready’s Gas Bar, Restaurant and Motel (1.5 stars!) This is the only option between Frededricton and Moncton! We remain on the traditional territory of the Malécite People. Fredericton is a low key Provincial capital. South of the river is the government and university part of the city and, with seemingly few students and no sitting legislature, it is pretty quiet. There are a few tourists, some of whom were watching the changing of the guard ceremony in Officer’s Square this morning. We, on the other hand, did laundry and had espresso and latte before lunch. 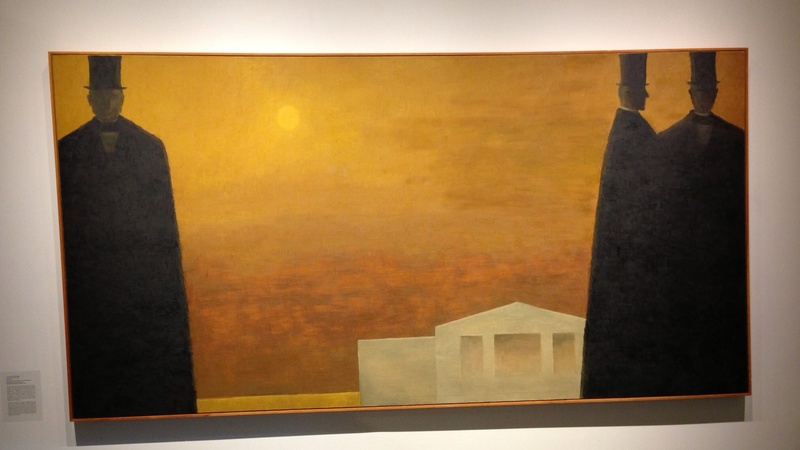 Afterwards, we visited the Beaverbrook Art Gallery opposite the Legislature Building. The exhibits were underwhelming except for a wonderful Alex Colville painting and a number of Christopher Pratt pictures. It was very hot and humid, but the weather broke while we were eating dinner in The Palate and we got very wet running back to the hotel. We hope that everything dries before we venture out tomorrow, only to be rained on again, if the forecast is correct! 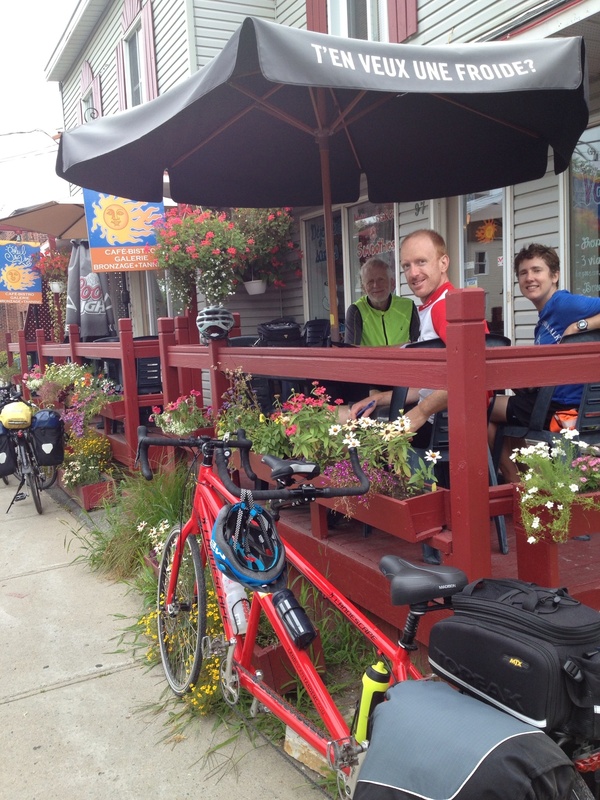 After a hearty breakfast at our B&B, we headed for the Sweet Spot Bake Shop for sandwiches and goodies for the road. The proprietor gave us advice about the alternative route out of Woodstock, the old Highway (#165), which we planned to take. 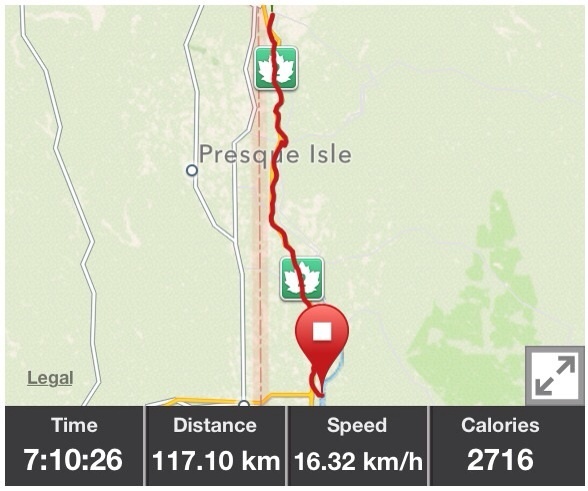 It was strange, as the road was as good as some sections of the current TCH in other provinces and had a wide hard shoulder, but there was hardly any traffic! 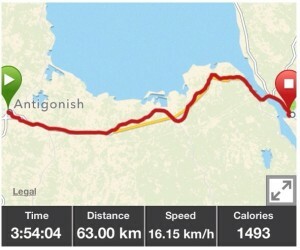 Just before we thought we had to go back onto the new highway (TCH #2), we were told by some fellows at the Irving gas station in Meductic that this was unnecessary as there is a connection for cyclists now via the “old old” highway”, which would take us all the way to Fredericton. So, we turned off at Richie, as directed, past a sign saying “Cul-de-Sac”. The road gradually got narrower and more shaded and looked more like an archaeological relic. 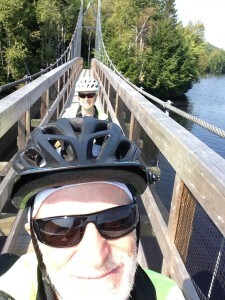 After a while, the road ended and we walked our bikes for a short while to find, as we had been told, a small suspension bridge for pedestrians and cyclists over the Shogomoc River. The old road had disappeared under the water to reappear on the other side of the bridge. This was a delightful find and we stopped and made espresso under the trees. 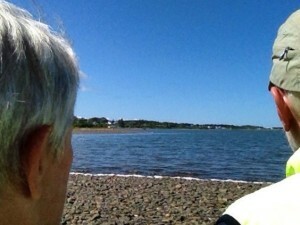 On the other shore, we met an older couple with their grandchildren whom they are telling about this old (old) highway they used to take to Fredericton. 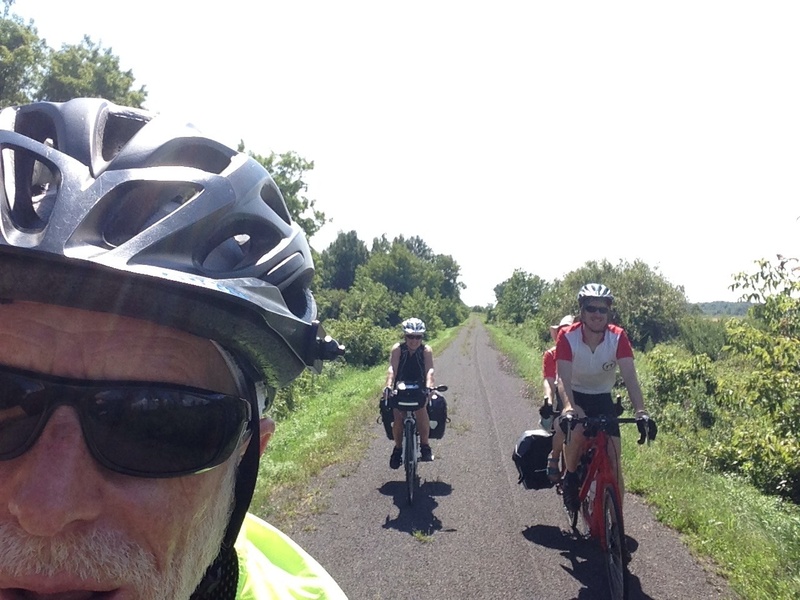 Back on the old highway (now 102), we made good progress, although it was becoming really hot. 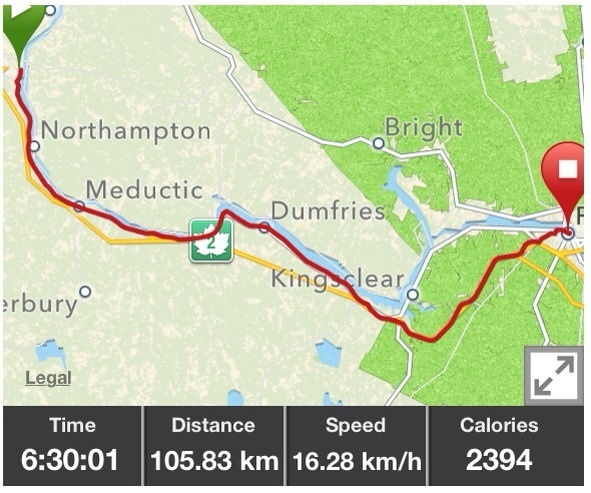 We stopped to talk to another local cyclist later, who told us there were some “killer” hills ahead and the shoulder disappears closer to Fredericton. He suggested we continue on the #2. If a fellow bicyclist talks about “killer” inclines, we take this seriously! 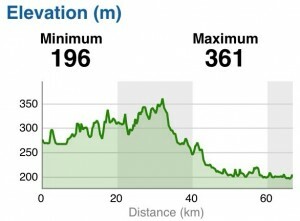 We made our way back on to the #2, which still had long hills, but not of a “killer” variety. 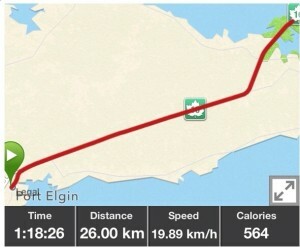 It was very hot, though – the temperature on the Garmin read 35C – and we guzzled water. We were relieved to arrive in Fredericton and the a/c of our hotel. We haven’t had a tough day for a while now, so I guess we were due one. We woke to the sound of rain, but it had stopped by the time we left the B&B and the day remained dry, but hot and muggy, with thunder clouds in the distance. 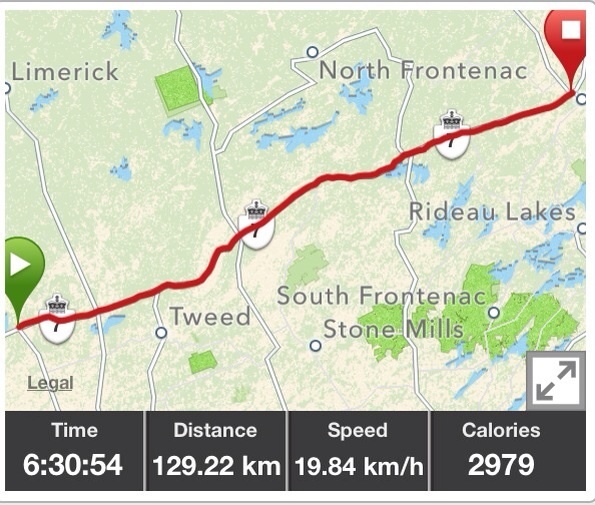 The cyclist who had suggested the alternate route for yesterday had advised us to stay on the TransCanada after Grand Falls, as the side roads are windy, hilly and dangerous. So we stuck to the #2 all the way, except when we left the highway at Aroostook, looking for Mary’s Bake Shop, which we eventually found in Perth-Andover. We had an early lunch of homemade vegetable soup and tuna sandwiches (we were too full for Mary’s homemade pie!) and bought a date square to share later. The highway has a wide, paved shoulder, but the constant long hills and a stiff headwind, were tiring. 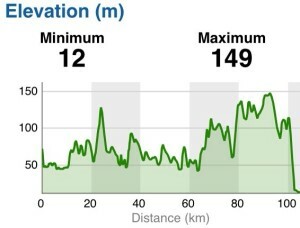 Joe, the cyclist we met in Ontario, described this section of the route as saw-tooth topography, i.e., up and down and no flat! 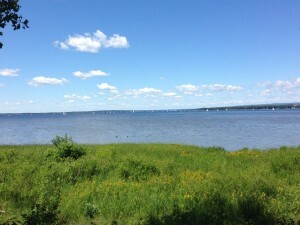 We did get great views of the St. John River. 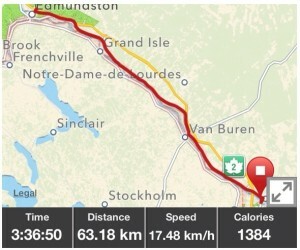 We rode down the hill from our hotel for espresso at Presse Café and then onto the transCanada (Highway 2). We had considered taking an alternate route, but it is longer and we were unsure as to the hard shoulder and hills. 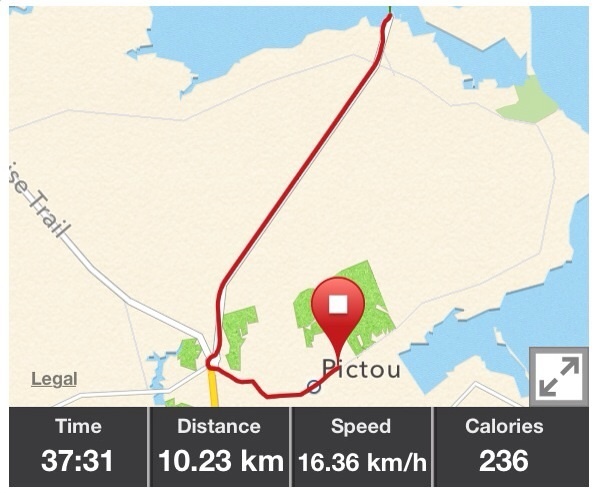 After a few kilometres we were overtaken by a local older cyclist. 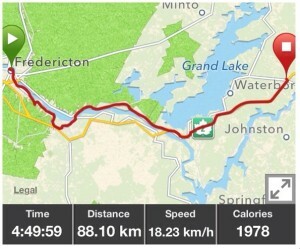 After passing us on a long incline, he swung back and suggested we might want to take Highway 144 instead, as it was less hilly and more pleasant, at least to Grand Falls. 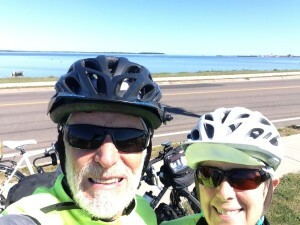 His advice was good and we had a leisurely ride close to the St John River, stopping for lunch at Saint Leonard. 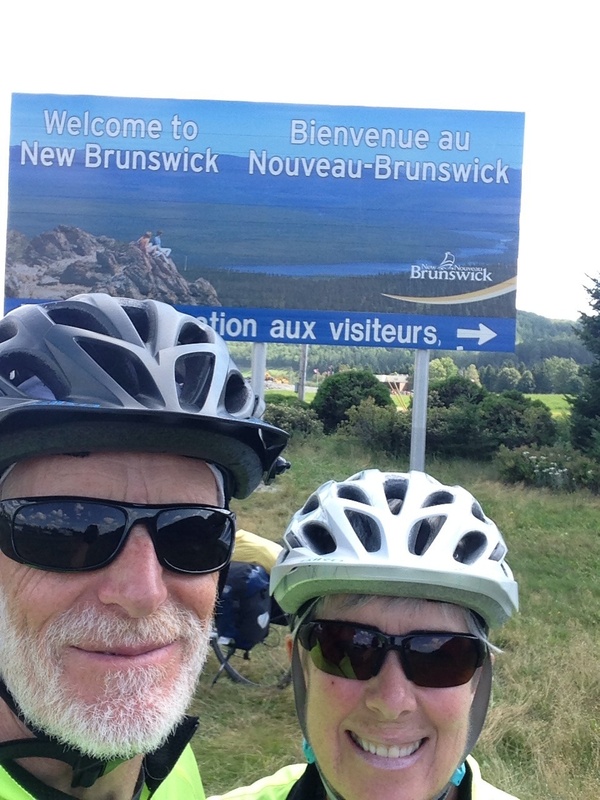 In visiting small towns and talking to people we realised that this part of New Brunswick is definitely francophone. 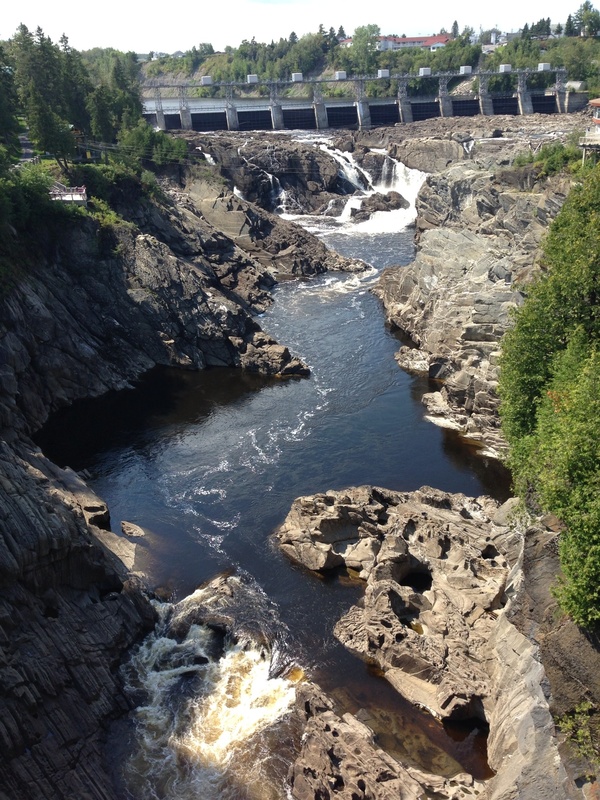 Arriving at Grand-Sault, we stopped to look at the falls, which would be more impressive if the hydro dam had not been built above them in the 1930’s. 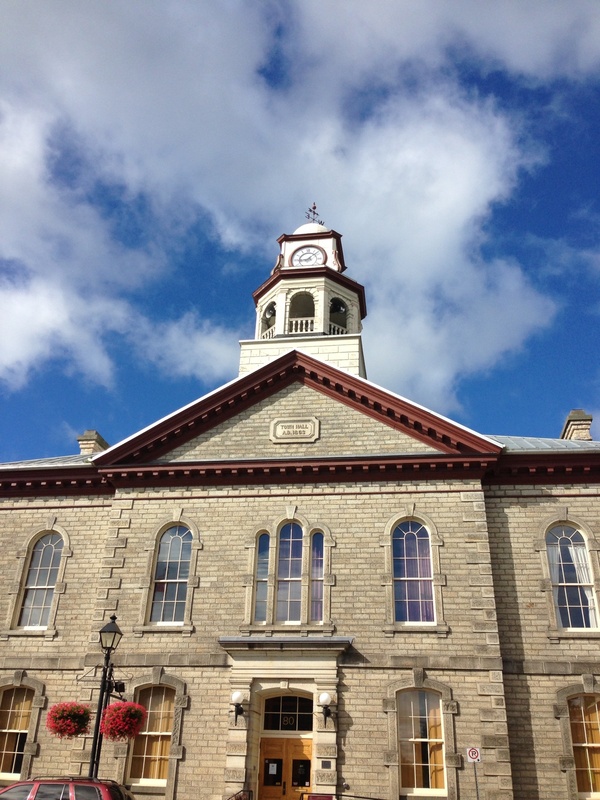 Of more interest is the history of the town, only one of two in Canada with both French and English names. The community is the most bilingual in Canada with more than 80% of people speaking both official languages. On the road, Acadian flags were again in abundance. Wikipedia has given us some more insight into why. Acadia was a colony of New France consisting of what is today the Maritime Provinces, eastern Quebec, New Brunswick and parts of Maine. As part of the British military campaign against New France in the mid 18th C, the British deported Acadians, first to the Thirteen Colonies and, later, to England and France, from where many migrated to Louisiana. 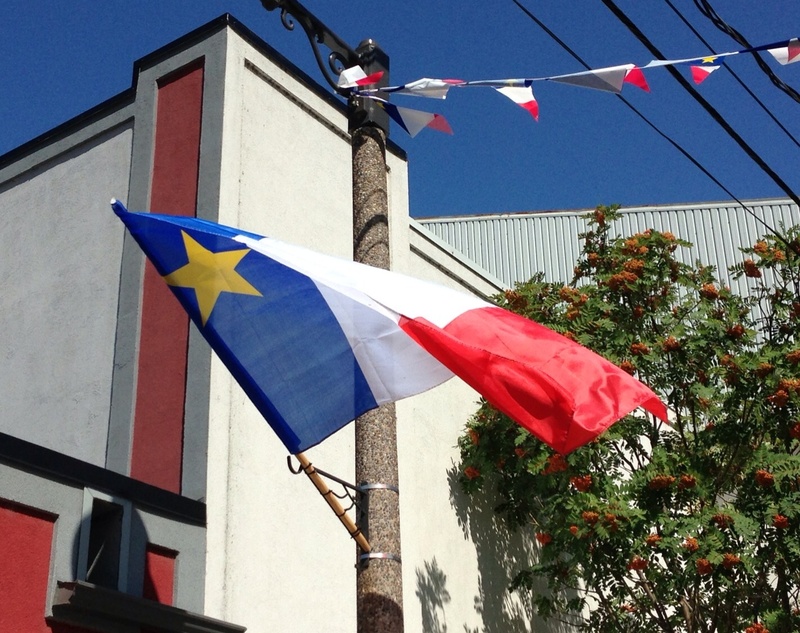 In 1764, Acadians were permitted to return to British territories, provided they took an unqualified oath of allegiance. Under the deportation orders, Acadian land tenure had been forfeited to the British crown and the returning Acadians no longer owned land. The Acadian expulsion was memorialized by Longfellow in his poem, Evangeline. Acadians who lost their land again in New Brunswick to loyalists fleeing the American revolution, apparently made a deal with the Malécite to settle in Madawaska, the region of the upper St John River in New Brunswick and Maine, in exchange for defending the Malécite against further encroachment of their lands. Wildlife Notes: America Bald Eagles over the St John River. We remain in the traditional territory of the Malécite People. We know this site reads more like a food blog at times, but last night was amazing! We booked a table in the dining room of the Auberge du Chemin Faisant for 6:30 pm and left there 3 hours and 8 courses later! The emphasis is on regional cuisine and sensory experience. Every course was a work of art! One course, for example, included a tiny bowl of corn soup, one grilled jumbo prawn with curry mayo, a tiny corn/curry muffin and a miniature ice cream cone with curry-flavoured ice cream (see photo album). It went on like this. 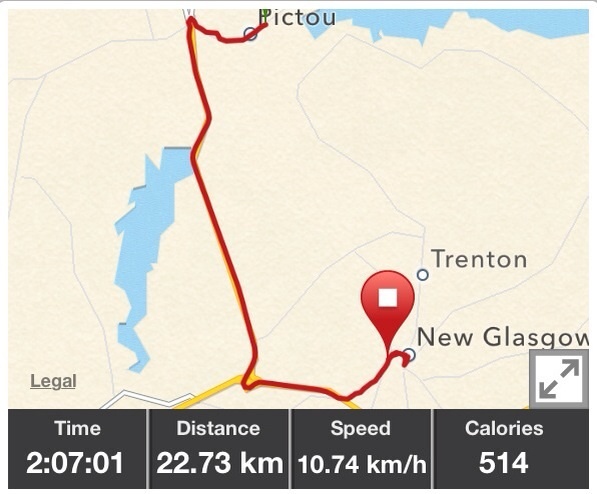 We had indicated that we did not want to drink much alcohol, as we were cycling the next day. They offered to do 4 wine pairings of 1.5 oz each. After the chef had finished in the kitchen, he came out into the dining room and played the piano for his guests. After breakfast at Le Pub du Lac (yes, even after last night Paul needed porridge! 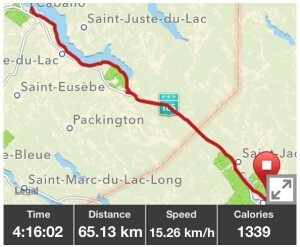 ), we bought fresh 9-grain bread from the boulangerie to have with local cheese for lunch and headed south-east on the bike trail. Yesterday evening we were told that road works on Highway 85 made this the best choice. 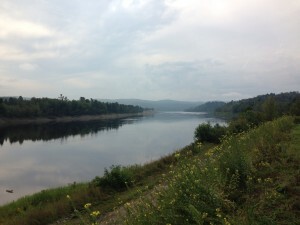 The trail was better than it was south of Rivière du Loup, and it took us along Lac Témiscouata where people were fishing, swimming and boating. On cycling through Dégilis, at the south end of the lake, looking for non-existent espresso, we saw lots of flags which we did not recognize. Then we noticed a poster about an Acadian festival. 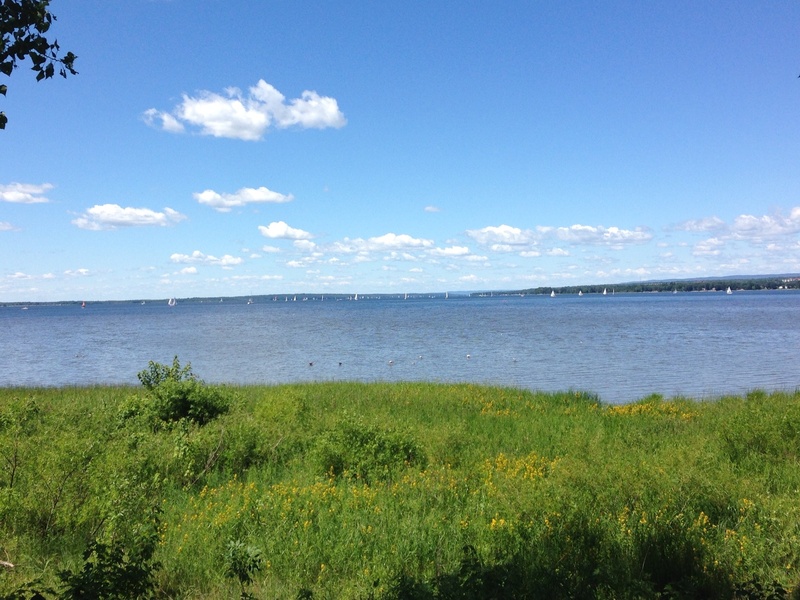 Later we also found that the 2014 Congrès Mondial Acadien will be held in this part of New Brunswick, Quebec and Maine (which is just across the St. John River from here). 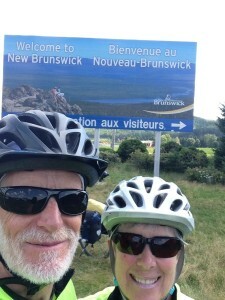 After Dégilis, the trail was disrupted by road works, so we spent the rest of the day, and entered New Brunswick, on Highway 2, the Trans Canada. We can see Edmundston from the viewpoint of our hotel up the hill above the town. 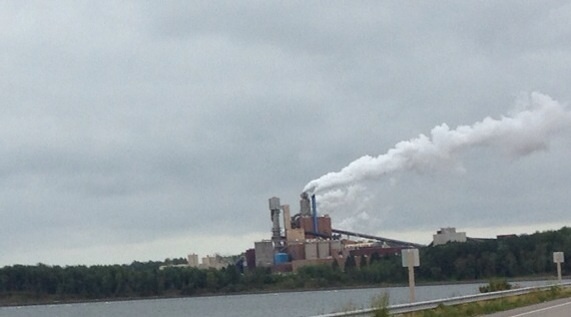 The pulp mill unfortunately dominates the community. We passed the Madawaska Malécite First Nation community. This was one of three important villages on the Malécite annual migration route from the Bay of Fundy to the St.Lawrence. The grand Fleuve St Laurent looked lovely in the morning light. On leaving our hotel, we headed to a boulangerie as we knew that there was little chance of lunch on the route today. We bought cheese, fresh bread (more later) and goodies. There was a stiff climb out of lower Rivière du Loup. We joined the Route Vert 8 on the Petit Témis Interprovincial Trail, but soon found that the crushed stone surface was too soft and unstable for us. 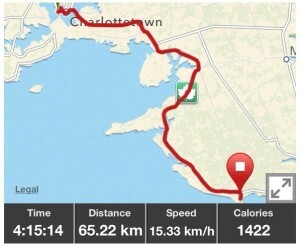 We reluctantly joined our old friend/ foe, the Trans Canada Highway for the rest of the day. There was a good hard shoulder and the sun shone. 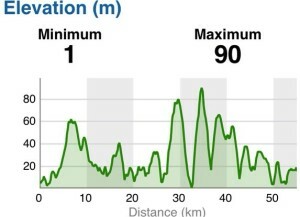 We knew that there would be hills but not as many as we experienced for the first half of the ride. Some of the later descents made up for the long inclines, in part. On stopping at the road side for lunch, we discovered that the bread we had bought was in fact a loaf- like croissant, enclosing a whole round of brie, nuts and cranberries – delicious and filling! 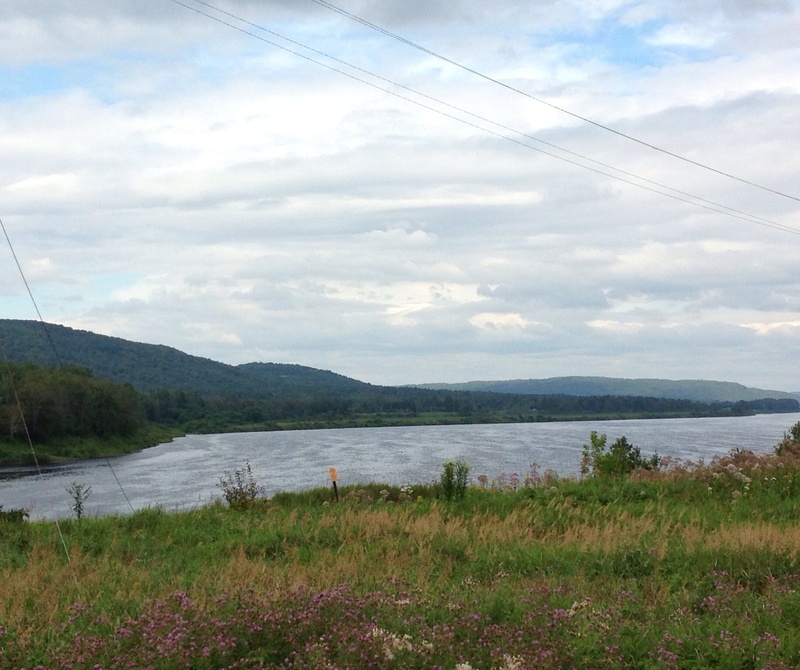 This is a land of forests and lakes and we are staying in the pretty village of Témiscouata, right near the lake. As today’s itinerary was short, we had time to wander around and partake of ice cream in the afternoon sun. We are going on a culinary adventure tonight! We remain on the traditional territory of the Malécite people. We passed through the First Nations community of Whitworth (the Malécite of Cacouna). Cycling though the Province of Quebec has been a revelation, not only because of the Route Verte bike path system, the very pretty towns, charming gites, amazing boulangeries and friendly people, but also in bringing home to us the long history of French settlement in Canada. All of the towns we have passed though were founded between the early to late 17th century, 100-150 years before the defeat of the French on the Plains of Abraham. 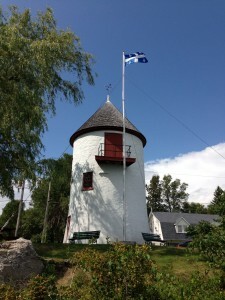 The official website for the town of Saint-Jean-Port-Jolie recounts the famine of the spring of 1759, when the inhabitants were prevented from planting their crops by the invasion of British troops. As with neighbouring villages, the town was burned and its buildings and boats destroyed by the troops, as they made their way from Kamouraska to Quebec (City). Quebec’s motto, Je me souviens, takes on new meaning for us. 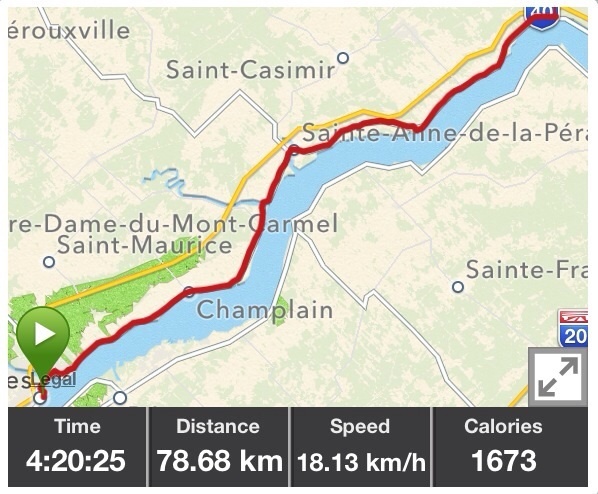 We stayed on the #132 most of the day, leaving it for a long detour around road works at one point and also to follow La Route des Doux Pays, a Route Verte 1 path along the shore of the St. Lawrence. 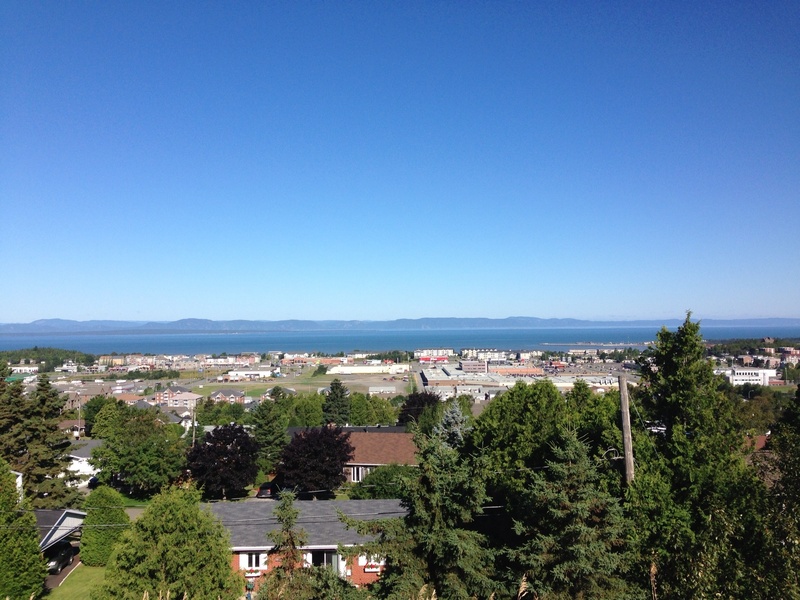 We came up from the path at Kamouraska, where the St. Lawrence begins to look and smell more like the sea. We ate lunch in the Bistro Côté Est (grilled cheese with old cheddar and a side of apple jelly). It rained quite heavily while we were having lunch, but otherwise it was a mostly dry, partly sunny day. We watched the sun set over the St. Lawrence from our hotel room. 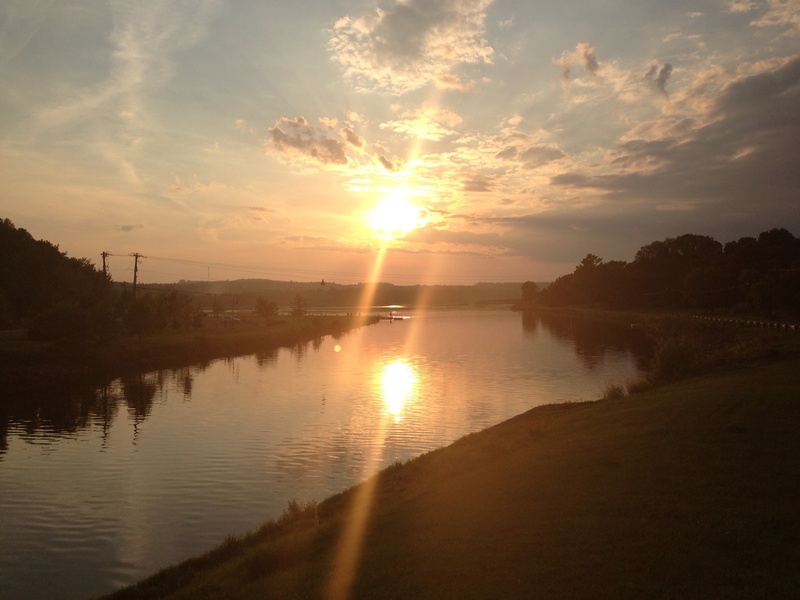 We will be sad to leave this mighty river tomorrow when we turn south. We are on the traditional territory of the Wolastoqiyik (Malecite) people. Marius and Helen joined us for the first half of today’s cycle. 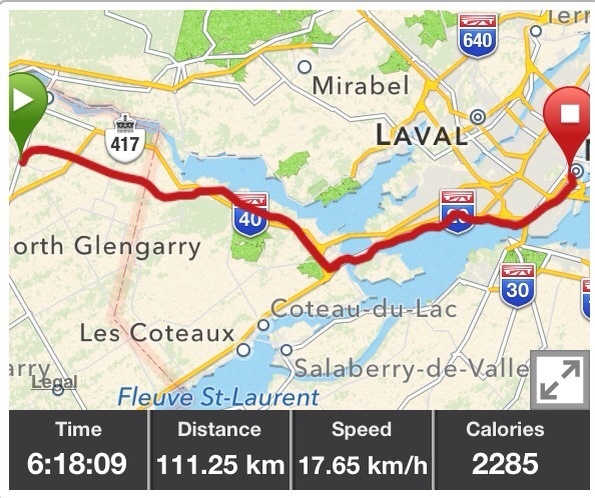 It was our last ride together on this trip, as they return to Montreal by train tomorrow and fly back to England on Saturday. It has been wonderful to have them along and to share our experience with them. We have greatly appreciated their enthusiasm, humour and good company and their willingness to adapt their pace to that of their elder companions! Final guest posting from Team Twite: “What a difference a day made; Twenty-four little hours; Brought the sun and the flowers; Where there used to be rain” – from the song, What a Difference a Day Made. Alternative lyrics: “What a difference a wind made; Twenty-four miles per hour”. 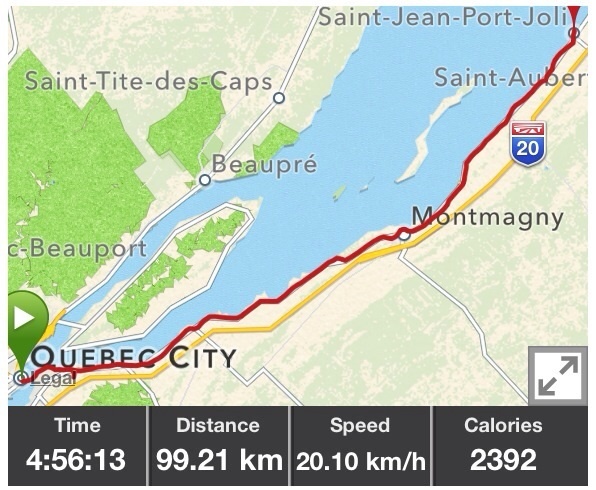 After a stop for post-breakfast coffee and food at Le Cochon Dingue in the Old Town area of Quebec City, we boarded the ferry to cross the Saint Lawrence to Lévis. The 10-minute ferry journey and the riverbank on the Lévis side both afforded great views of Quebec City, with an interesting juxtaposition between the pretty Old Town and the nearby industrial docks area. As may be gathered from the song lyrics above, the weather was dry and sunny and there was a good tailwind. 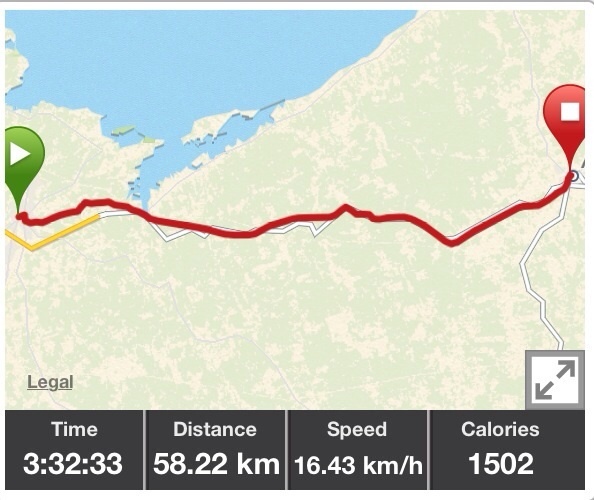 Combined with a fairly smooth surface on the Route Verte 1 cycle trail and, later, on the shoulder of Route 132, progress was rapid and it was not unusual to be achieving speeds of up to 40km per hour on flat sections and even faster downhill. 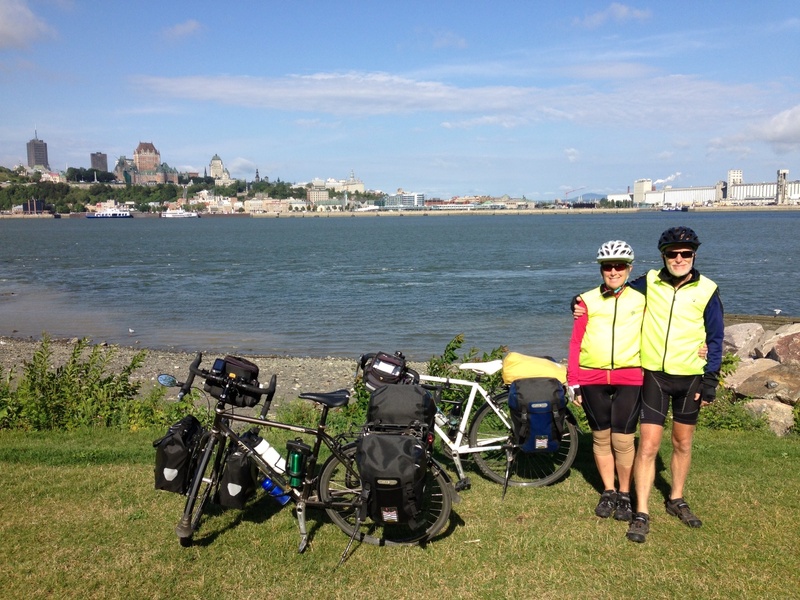 Helen and Marius had intended to continue cycling with Lois and Paul until lunchtime before turning around to head back to Quebec. However, due to the rapid progress eastwards and a difficult return journey into the wind, an earlier turnaround was required. 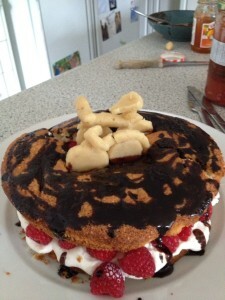 This gave a good excuse for a pre-lunch café stop (you can do these thing when you’re exercising all day!) at La Levée du Jour Boulangerie in Saint-Vallies, where we enjoyed fresh lemonade and cakes before saying our goodbyes and departing in opposite directions. 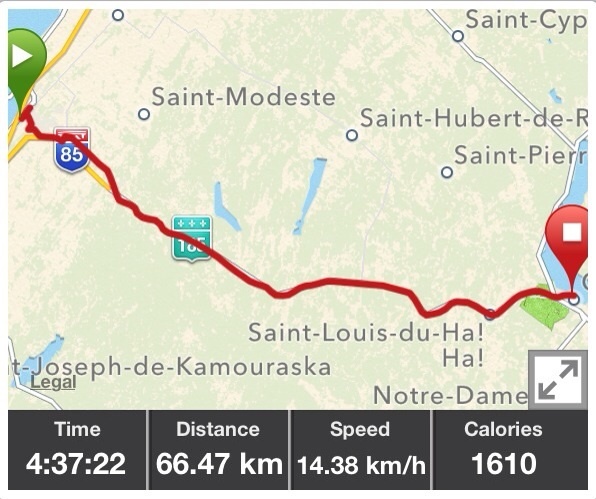 Team Twite made it back to their hotel in Quebec in a somewhat slower time than the outward journey, but before heavy rain set in during the afternoon. We’ve greatly enjoyed our 2-week stay in Canada. 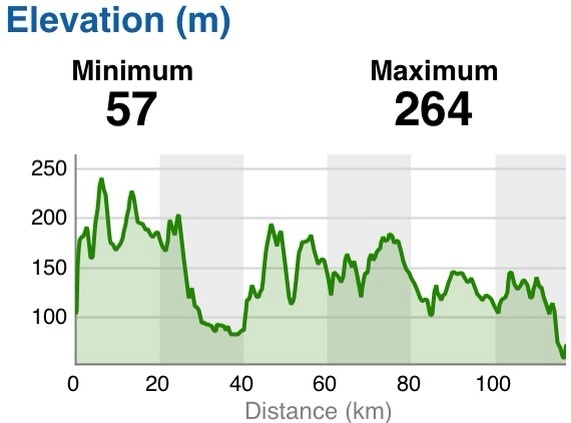 We’ve cycled around 950km in total whilst sampling a good variety of metropolitan and rural scenery, wildlife, accommodation types, food & drink, and road/trail surfaces. And, of course, we’ve had great company and cycling comradeship on the way. We are sorry to be leaving and wish Paul and Lois good weather, favourable winds, and safe cycling for the rest of their trip. (Paul and Lois) After seeing off Marius and Helen, we carried on along the #132, close to the south shore of the St. Lawrence. 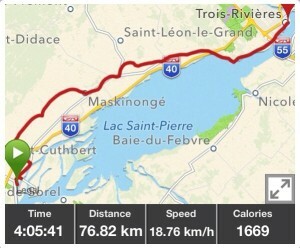 We had planned to only go as far as Montmagny today, as Lois has been having some knee discomfort (probably caused by 2 days of riding on unpaved trails last week), but as the roads were good, the winds were behind us and Lois’ knees had benefitted from a day off the bikes, we decided to stick to our original plan. 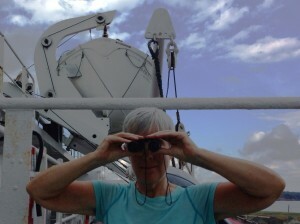 We continued to make speedy progress with the help of a strong tailwind. We stopped at a fromagerie on the highway to buy cheese to have with a crusty cheese loaf we had bought at the boulangerie, and picnicked in a park in Montmagny. In the middle of the river at this point is Grosse Île, a very important place in the history of public health in Canada. In 1832, a quarantine station was set up to prevent cases of cholera and typhus from Europe entering Lower Canada. 3000 Irish immigrants escaping the potato famine may have died here. 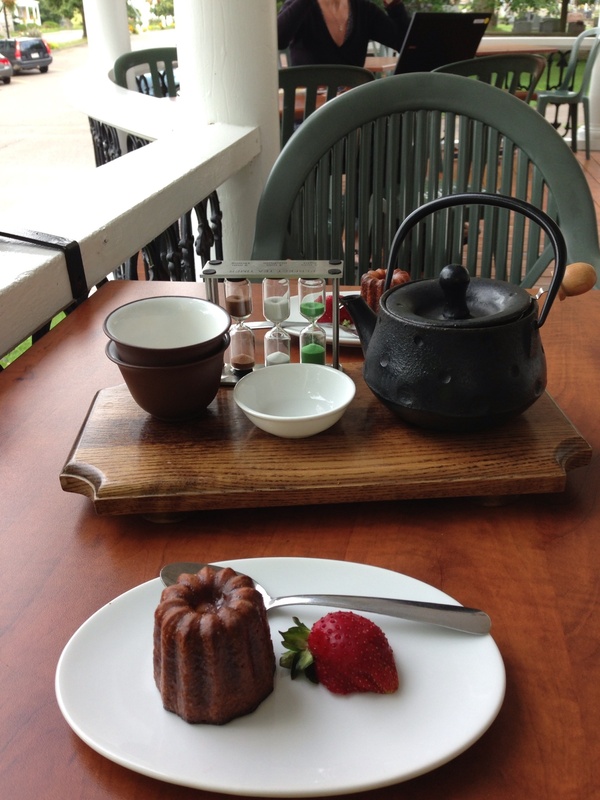 At L’Islet-sur-Mer, we found a delightful tea shop, where we had Darjeeling tea and canelés. We arrived at Saint-Jean-Port-Jolie just as a thunderstorm broke. Here, salt water mixes with river water, and the tides are apparent. This weekend there is a music festival on in the town, La Fête des chants de marins. During dinner at a bistro overlooking the river, a French accapello group from Brittany, Barababord, gave a spirited performance of sea songs. We can find no mention of First Nations in relation to the south shore of the St.Lawrence through which we are travelling. Paul and Lois spent the day doing laundry, sitting in cafes and visiting the shops in the Old Town. 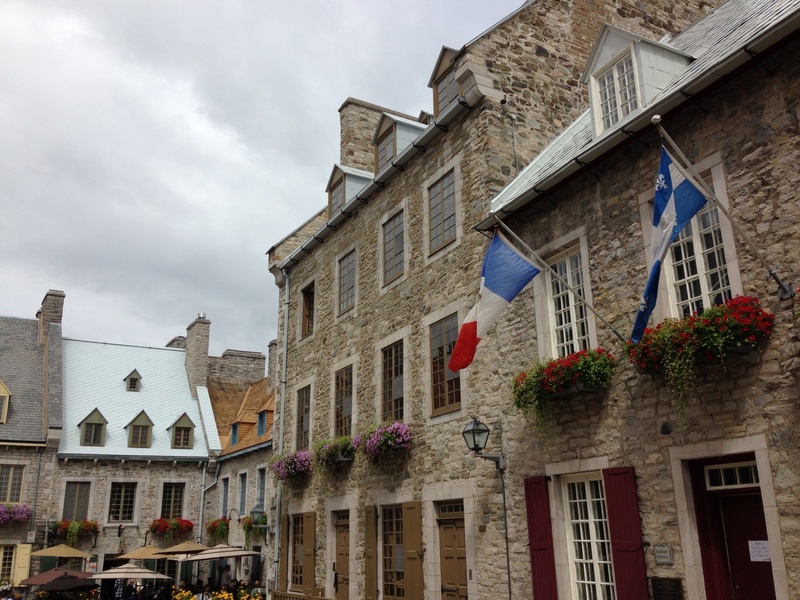 As we had visited Quebec City on a few previous occasions, we were content to just enjoy the ambience of this beautiful historic city. Twite team contribution #4: Team Twite decided to keep their legs exercised and cycled out to the Wendake First Nations reserve to the north-west of Quebec City. The town is home to Onhoüa Chetek8e, a museum based around a recreated traditional Wendat (a.k.a. 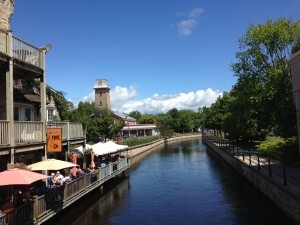 Huron) village. Whilst small and somewhat touristy, the museum provided a fascinating insight into the tribe, who left their traditional territory in Southern Ontario (on the edge of Lake Huron) in the 17th century following a huge number of deaths due to diseases such as smallpox and measles – brought by European settlers and against which the aboriginal community had no immunity – and war with the Iroquois nations. Traditionally a sedentary tribe who lived in longhouses and grew crops as well as hunting, the Wendat eventually settled in Wendake in the late 17th Century and have remained there ever since. We learnt a lot about the traditional Wendat way of life, including living in a longhouse (with all of your relations under one roof), building traditional canoes (which the Wendat specialised in and was one of the commodities that they traded) and which part of a beaver is the best to eat (the tail, apparently)! We also ate lunch inspired by traditional Wendat cuisine – in our case, sunflower seed soup followed by wild rice with either elk sausages or deer chilli. 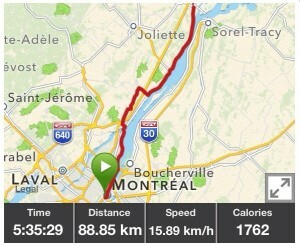 We cycled back via the Chute-Montmorency, an impressive waterfall (98.5 feet higher than Niagara Falls!) close to the Saint Lawrence. In the evening we all went out for a wonderful four-course seafood dinner at Le Marie-Clarisse in Quebec Old Town, before watching a large fireworks display over the Saint Lawrence. Guest posting #3 from Team Twite: “We’ve had some wet weather, but it’s not yet rained for a whole day” – Paul Gully, 13th August 2013, over continental breakfast at the Motel Sous les Charmilles, near Cap Santé. “But there’s one thing I know; The blues they sent to meet me won’t defeat me; It won’t be long ’til happiness steps up to greet me” – Hal David, from the lyrics to Raindrops Keep Fallin’ On My Head. Whilst the rain didn’t quite last all day, it tried to, persisting heavily from before we woke up this morning until we stopped for lunch on the edge of Quebec City. Thankfully this was due to be the shortest day, in terms of distance, of our 2-week stay and one of the shortest days of the whole cross-Canada trip for Lois and Paul. 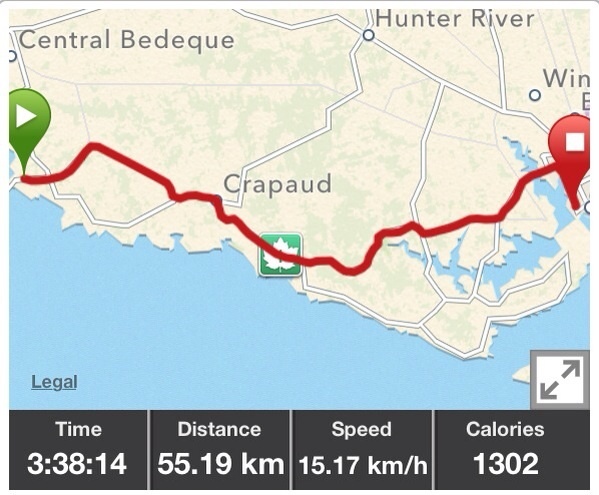 Progress was slow due to a steady headwind in addition to the rain, but we were refreshed and warmed by coffee and cake at the friendly Café Bistro De La Place in Cap Santé and then, later, by soup and tea at lunchtime. Our journey was lengthened somewhat by detours around various road construction sites on the edges of Quebec City but we eventually made it, wet and a little cold, to our hotel in the old city for a well-needed mid-afternoon hot bath. We’re now looking forward to a day off to enjoy the sights of the city (hopefully in the sunshine!) and to wash some clothes. Church of the day: L’eglise Saint-François-de-Sales de Neuville – constructed in 1864 around the heart of the first church dating from 1696. 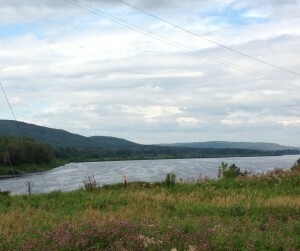 There is a community of Wandat First Nations (Wendake), within the boundaries of Quebec City. Until the mid 17th C, their ancestors occupied a vast territory covering parts of the US, Ontario and Quebec. 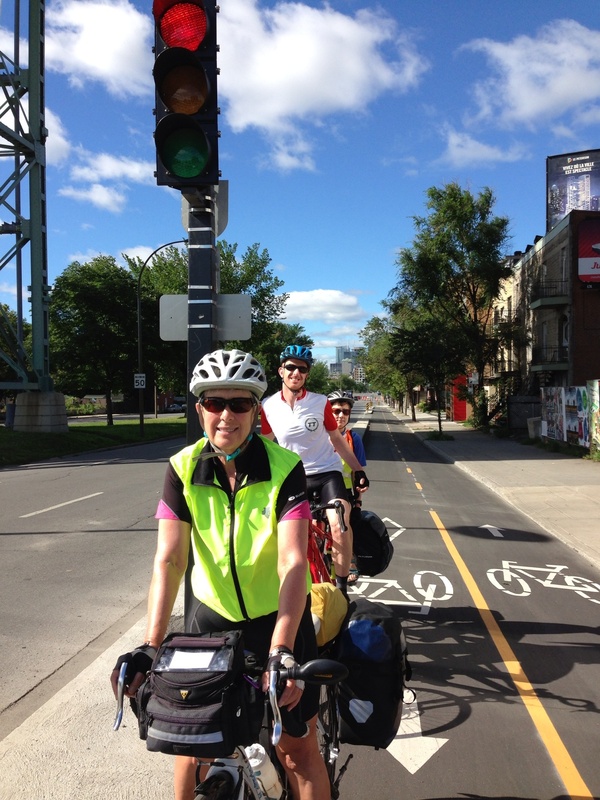 We have to give a plug for Quebec’s Route Verte system of cycle routes. 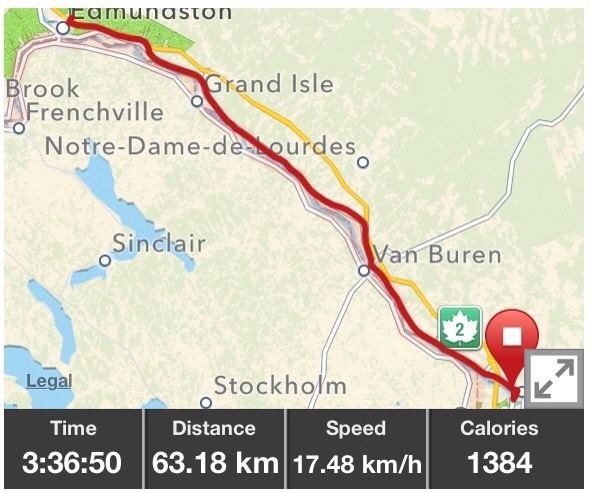 This network of routes, which includes marked paths, paved shoulders and designated roadways, and covers more than 5000 km of Quebec, from east to west, is a cyclist’s dream. 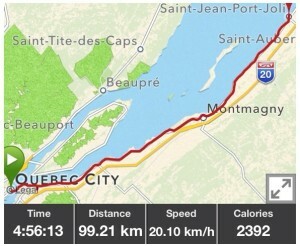 The system also directs cyclists to Quebec’s various tourist attractions. We feel like we are on holiday, rather than trekking across the country! After another multi-course breakfast, with delicious home-made delicacies, we set off again on Route Verte 5. Marius and Helen wanted to see a bit more of Trois Rivières, so they caught up with us on the road later. Route Verte 5, which we have been following since Montreal, has mostly followed the Chemin du Roy and has taken us through delightful villages and past a multitude of churches along the St. Lawrence. Today, we saw a windmill at Grondines, which, after two centuries of service, became a lighthouse from 1912 to 1967. We later saw a flour mill, at Deschambault, dating from 1802. A nearby bridge was destroyed by a flood in 2005 and was rebuilt with a sculpture in aluminum integrated into its sides (see photo gallery). 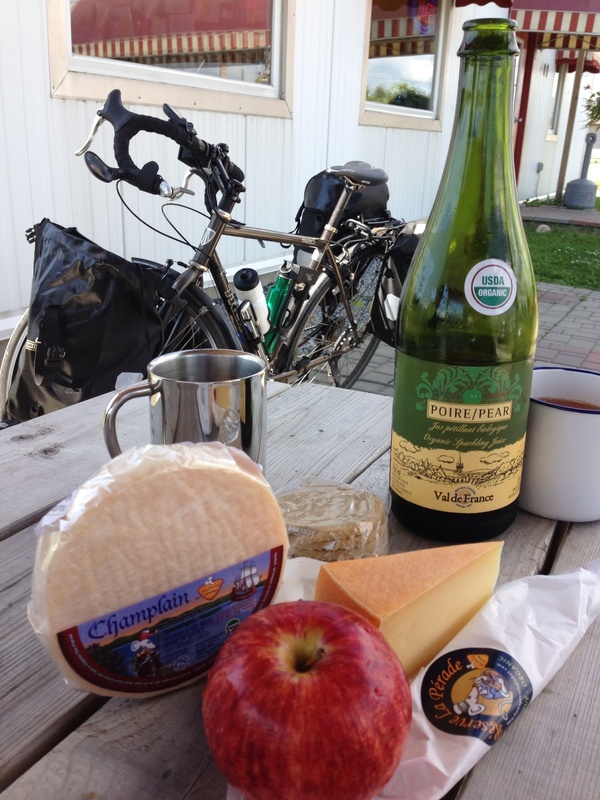 We stopped at a fromagerie in Sainte-Anne-de-la-Pérade, where we bought some creamy Champlain and a firmer Réserve La Pérade, which we enjoyed with our oatcakes and a bottle of sparkling apple/pear juice at a picnic table outside. Just as we were packing up to leave and considering whether we were about to get rained on, another customer pointed out a flat tire on Lois’ bike. Fortunately, we missed the shower while changing the tire. Later, dinner consisted of pizza delivered to our motel and eaten outside as the sun went down. A plaque at Batiscan states that, in 1639, Jesuits evangelized the local First Nations and encouraged them to settle in one place. It also notes that the area was frequented by Algonquin, Montagnais, Abenaki, Attikamek and Huron people. The dejeuner at L’Oie Blanche was not petit! The first course was cheese with fruit, banana muffins and toast with homemade preserves; the second was rich yogurt with fresh berries; the third, quiche, and the last, a very rich chocolate fruit bread with cream and jam (see gallery picture), all accompanied by good, strong coffee. 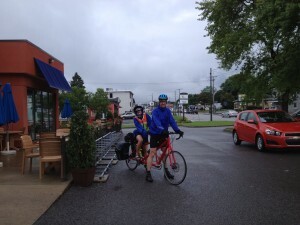 It was wonderful and we staggered out onto our bikes and on to our first stop, thankfully close by! 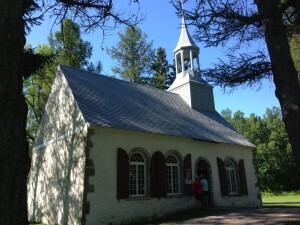 The Temple des Cuthbert was built in 1786 and is the oldest Protestant church in Quebec. We sat on a bench in the gardens here and video-chatted with Chris and Shinyoung. We continued on the Route Verte 5, through Saint-Barthélemy, stopping at the Magasin Géneral Le Brun, an historic site dating back to 1803, and now a museum, gift shop and place for a second cup of coffee. 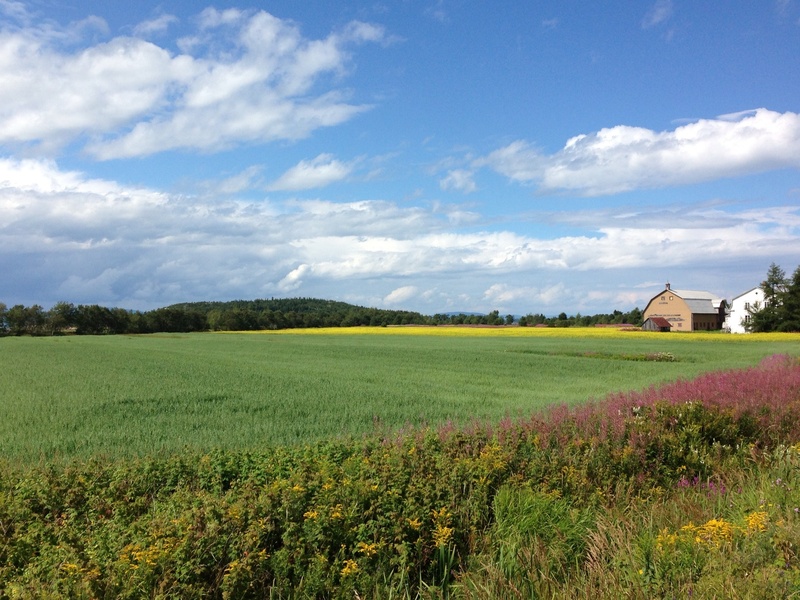 From the road we could easily see the narrow fields and strips of land which resulted from the seigneurial system of tenure introduced into New France in 1627 and which continued until 1845. The next stop, Maskinongé, founded in 1700, was devastated by a tornado in 1991, but the church has been repaired and dominates the town. There is a “to scale” reconstruction of the fourth previous church, destroyed in 1915. In Louiseville, we were only able to see the outside of the Église Saint-Antoine-de-Padoue, dating only from 1917. We had lunch at a chip shop in Yamachiche, where we also had a video chat with Paul’s sister, Elizabeth, as well as Catherine and Nathaniel. 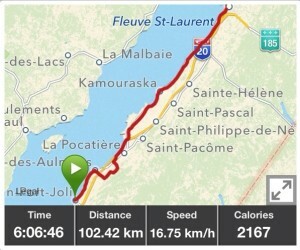 After lunch, we sped on with a good tailwind, which, when we came along side the St. Lawrence, we realised was a strong on-shore breeze which had brought out many kite surfers at Pointe du Lac. 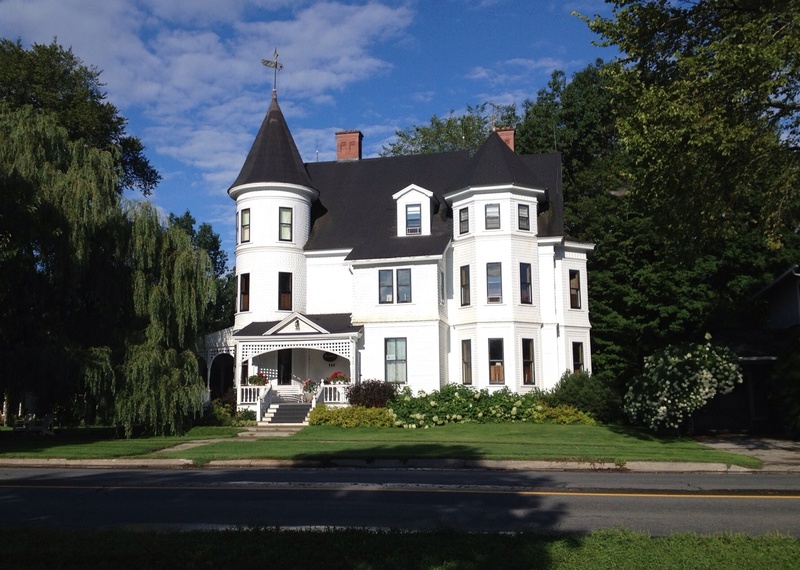 We checked in to the lovely Gite Loiselle in old Trois Rivières, near the old Ursuline Convent, and L’eglise Saint James, which was built originally in 1754. When Champlain arrived in the 17th c, this area was being used by the Algonquin and Abenaki First Nations. 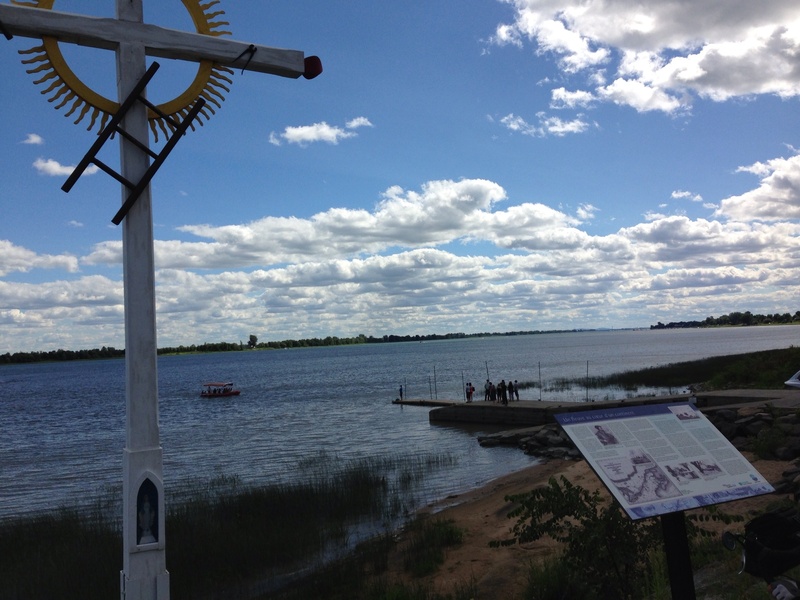 The closest First Nations community, which is Abenaki, is across the St. Lawrence River at Wôlinak. Guest posting #2 from Team Twite (as edited and with additions by P and L): Breakfast at Restaurant Plaza McGill proved to be large, requiring a second table to accommodate some of Marius’ and Paul’s plates whilst they ate their way through the first course of a vat of oatmeal each. 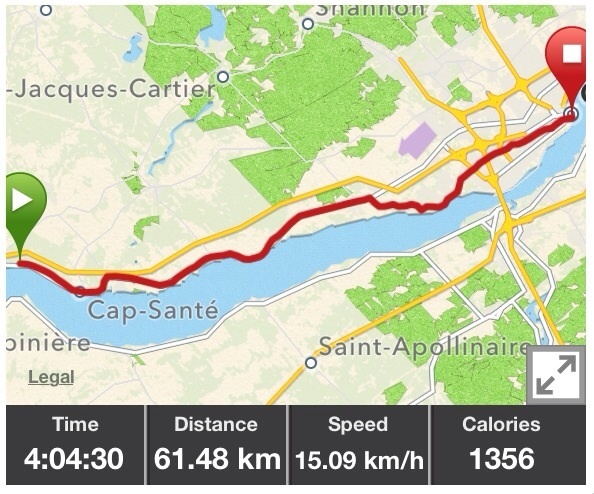 Unfortunately, the coffee wasn’t great, so we needed to stop elsewhere for a decent espresso before leaving Montreal along the riverside cycle track, where we enjoyed varied views of riverside parks, aquatic leisure facilities, and local industrial sites. Going along Île de Montreal we realized the extent of the Port. A plaque explained that the river had been rehabilitated by dredging a huge amount of sediment contaminated by the petrochemical industry. At Repentigny, we saw the Moulin Grenier which was built orginally in 1820. We stopped at a Harvey’s burger outlet to use the bathroom facilities, but declined to buy any of their famed hamburgers on the basis that they contained too much meat. However, whilst stopped we were pleased to have some Facetime with Maritia, Jade and Rhys, during which we learnt that they were also about to get onto their bicycles to cycle to Jade’s ballet lesson, which brought to mind all of them cycling in tutus. During the conversation, it also seemed to be agreed that Maritia would take Jade paragliding for her 18th birthday, as Jade had been fascinated by the paragliders during a recent daycare field trip to Grouse Mountain above Vancouver. 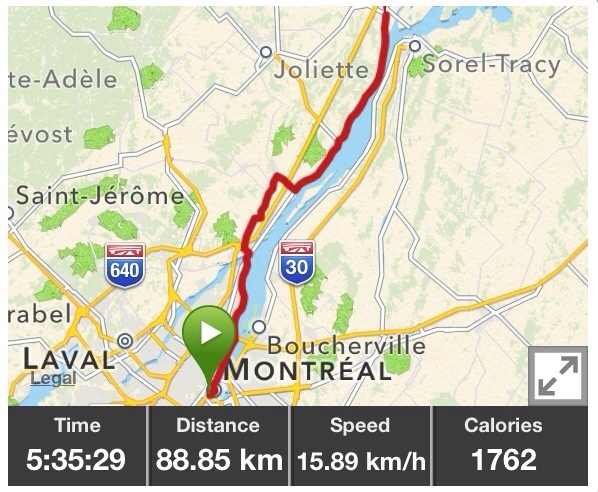 After leaving the suburbs of Montreal, we joined the historic Chemin du Roy, the eighteenth-century French-built highway between Quebec and Montreal named after the French king Roy. We had a fantastic lunch together at a Boulangerie in L’Assomption, after which Team Twite and Team Gul-lie/Les-ly decided to travel separately during the afternoon as the tandem was crying out for a couple of hours of riding at its design speed (fast!). Lois and Paul took their time stopping at Saint Sulpice at a display celebrating its tricentenary in 2006 and seeing ice fishing huts sitting on the river bank ready for next winter. Despite the flat riverside cycling with pleasant views, everybody was glad to arrive at the beautiful Gite d’Oie Blanche in Berthierville, where a soak in an antique cast-iron lion-footed bath awaited. We were greeted warmly by our hosts with glasses of iced tea served in the garden. Later we walked into the town centre by the river. The Festival Tout pour la Musique was in full swing when we left. This part of Quebec was colonized in the early 1700’s. we have not yet discovered which First Nation was here at that time. We “self-catered” our breakfast with the provisions left by the B&B (juice, oatmeal, scrambled eggs and toast) and espresso made by Paul, stopped at Sam’s Kitchen (the pastry shop that opened early for us) for sandwiches and banana muffins for lunch, then cycled back to the Prescott-Russell Recreational trail. The weather was overcast and muggy, only clearing late in the afternoon. We carried along the trail to its end, through pasture and farm land with crops of wheat, barley, corn and soy beans (? ), and then followed side roads into Quebec, stopping at Rigaud for coffee. 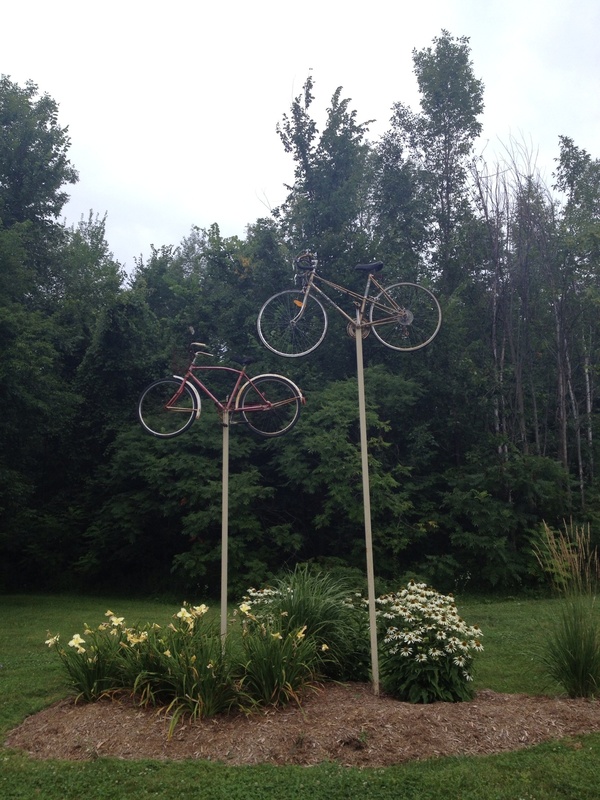 Just past Rigaud, we noticed a bicycle-themed park, where Marius climbed a tree in order to indulge Lois’ desire to take a photos of the bikes on poles for Jade. 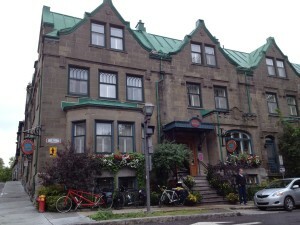 We soon joined the Route Verte, which took us across Île Perrot and onto the Île de Montreal, through the pretty villages of Sainte Anne-de-Bellevue and Beaconsfield and along the Lachine Canal to our hotel in downtown Montreal. We are on the traditional territory of the Kanesatake Mohawk Nation. 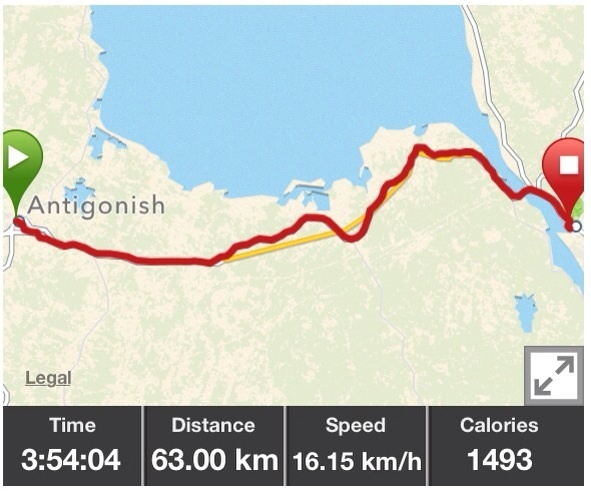 Guest posting from Team Twite and their Tandem (Marius and Helen): Day 4 of cycling in Canada, and Day 1 of cycling with Paul and Lois. After breakfast at the Best Western in Ottawa – get there before 7 am to beat the crowds! 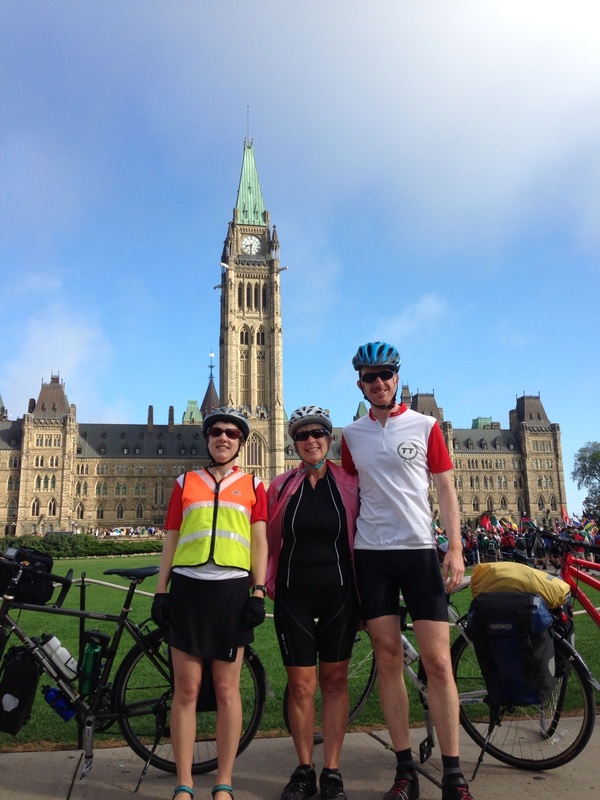 – we started the day properly with expresso (or tea if your name’s Helen) at Bridgehead, before photos in front of Parliament, where hundreds of Scouts from around the world had turned out to greet us….and to be addressed by the Governor General. 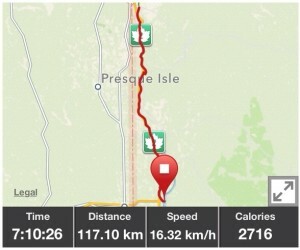 We then hit the tarmac, weaving through the suburbs before joining the Prescott-Russell railway line. The line was turned into a leisure trail (bikes in summer; skidoos in winter) in 1999 and provides a good crushed stone surface without any significant slopes. 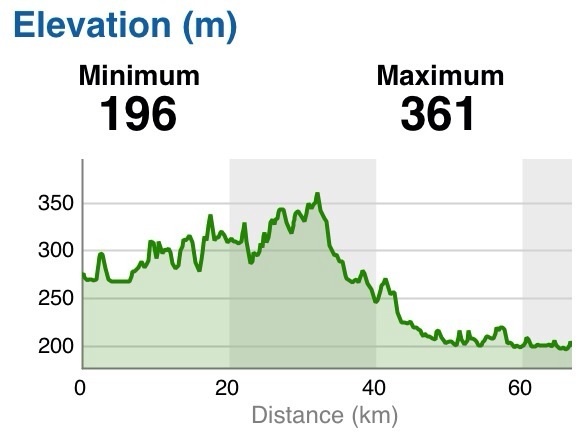 Whilst the day was hot, we were sustained by a lunch of sandwiches and cake (also purchased at Bridgehead this morning), and sheltered from the sun by trees lining some of the route. 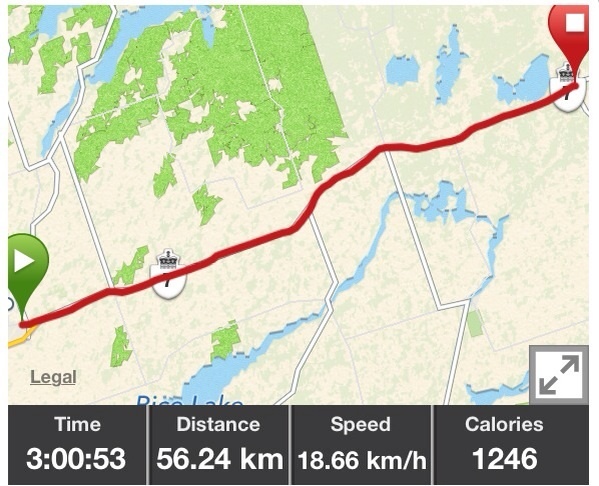 We continued on the same trail through the afternoon, before leaving to ride into Vankleek Hill (“Gingerbread Capital of Ontario”) to find our accommodation, a beautiful small house. Team Gul-lie (or Les-ly) proved to be good company and knowledgable about local birdlife, flora and bicycling hand signals. We understand that they also excel in medical matters, but hope not to have to try this out. 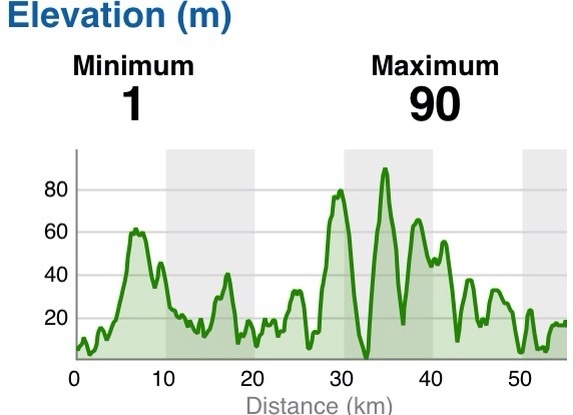 We’re looking forward to sampling the beer from Vankleek Hill’s Beau Brewing Company this evening, but apparently we have to cycle to Montreal tomorrow so we can’t have too much. Highlights (sites): Bourget station (lovely old station building still standing); Plantagenet (for the ice cream shop); Alfred’s Bog (for the name). Highlights (wildlife): Turkey Vultures; butterflies (lots, and varied); 2 garter snakes (1 dead, 1 very much alive); horse flies (many; maximum flight speed of around 20kph); turtle; large as-yet unidentified hawk-type bird. p.s. (from Lois) We did sample the beer, which was very good, and managed to resist compromising our ability to remain safely on the straight and narrow (cycle path) tomorrow. We also toured the town, which included having a look at Higginson Tower, and talking our way into a pastry shop that was closed (the owner has also agreed to let us in at 8:00 tomorrow morning, although she doesn’t open until 10:00). We remain on the traditional territory of the Algonquin Nation. We have had a great couple of days in Ottawa, connecting with friends, visiting old haunts and recharging. Paul was able to meet up with a colleague from the Public Health Agency and WHO, John Rainford, to chat about risk communication and possibilities for collaboration. Our bikes have been re-serviced, at McCranks Cycles. They both now have new chains and are sparkling clean. Lois’ bike also needed new bearings for the bottom bracket which, unbeknownst to us, had rusted and seized. We also stopped by our old hair salon for long overdue haircuts. 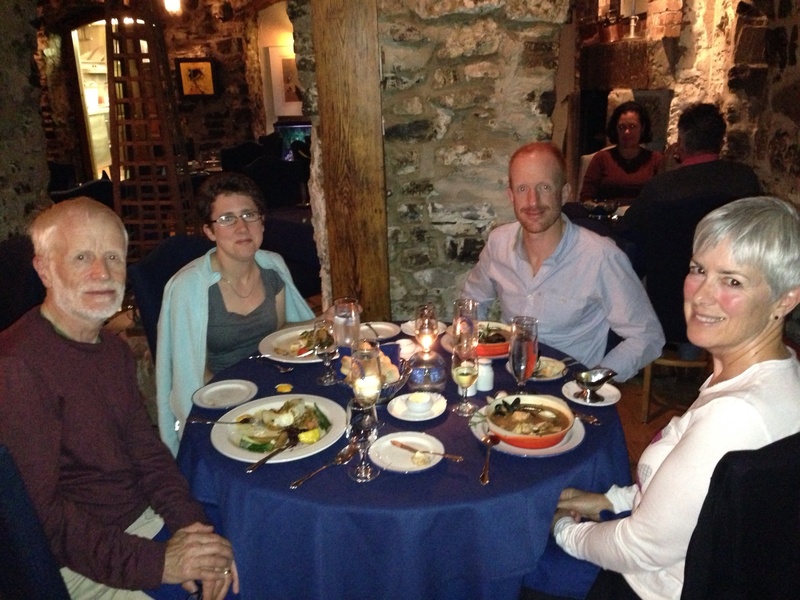 Neil, our previous hairdresser, is from Newfoundland and we got tips on restaurants and things to do in St John’s. Lois visited her favourite store, Ça va de Soie (the results of which will be mailed to Vancouver!) as well as her old spa. 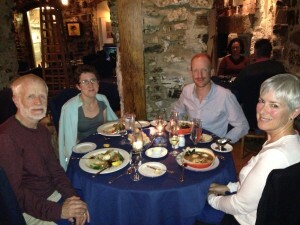 Marius and Helen arrived from Montreal Tuesday afternoon and the four of us attended an Ottawa Chamber Music Festival concert of piano (Andrew Armstrong) and violin (James Ennes) pieces by Beethoven, Bach, Prokofiev and Ravel, repairing afterwards to the Manx pub for a late dinner. 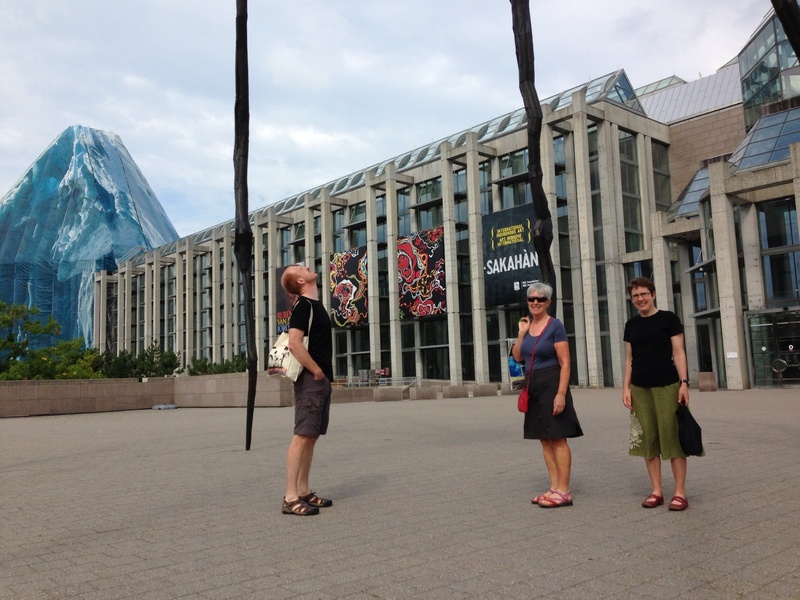 On Wednesday, after coffee in the Byward Market, we all visited the National Gallery, where there is an enthralling exhibition of indigenous art from across the globe entitled Sakahàn. Later, we went to visit Don, Claudia, Leyla (and her boyfriend) and Toby, for tea. It was lovely to see them all and catch up on news and progress in their lives. 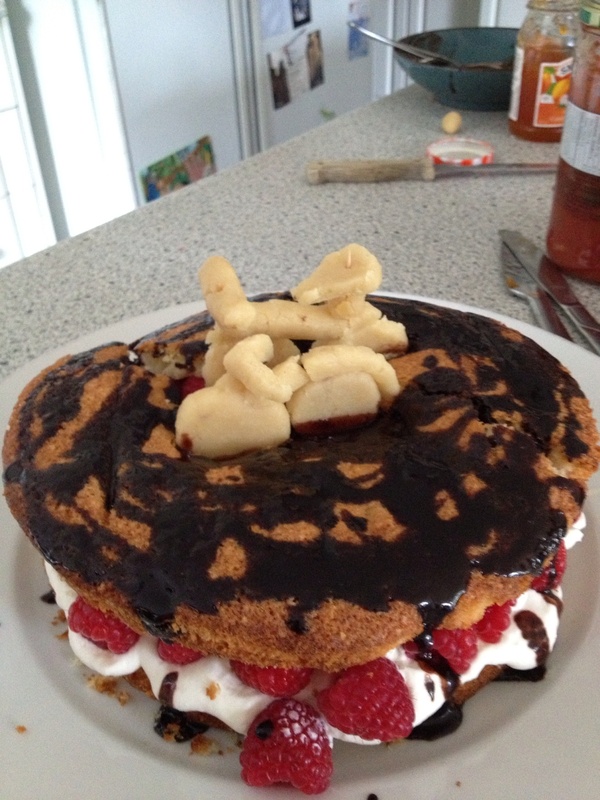 Claudia had made a wonderful strawberry layer cake, adorned with home-made marzipan bicycles (in addition to freshly-baked bread and apple pie)! We ended the day with a “fusion sushi” dinner at Kinki’s and discussed plans for leaving tomorrow. 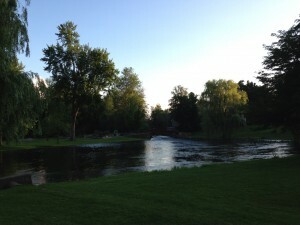 Hopefully, the thunderstorm that began late afternoon will have cleared by morning. 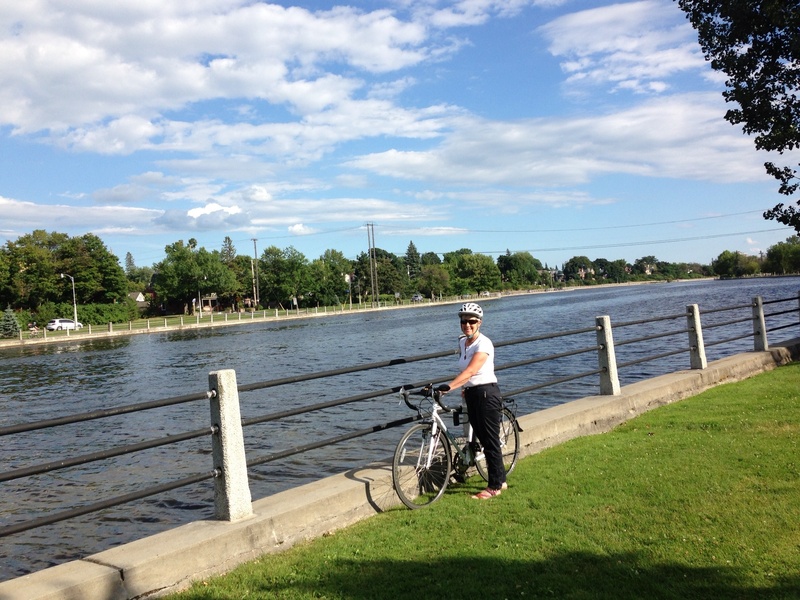 What a perfect way to approach Ottawa on this trip – via the Trans Canada trail! It was a gorgeous day with no thunder clouds in sight. Even the winds were calm. 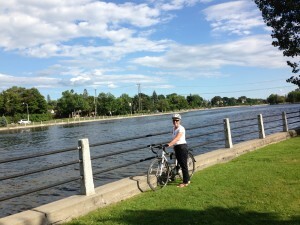 Stopping at Coutts for coffee and to buy sandwiches for lunch, we cycled north-east along Mississipi Lake and into Carleton Place. 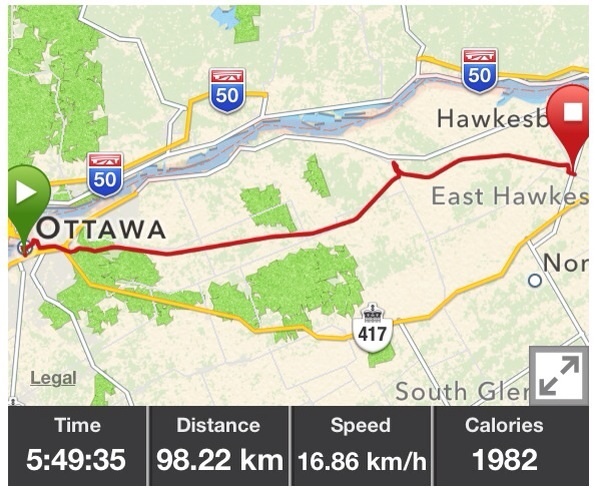 There, we picked up the Trans Canada Trail and then the Ottawa River bike path for 50 km into the Nation’s Capital. We both felt nostalgic catching our first sight of Britannia Bay, then the beach, and riding by our old house. 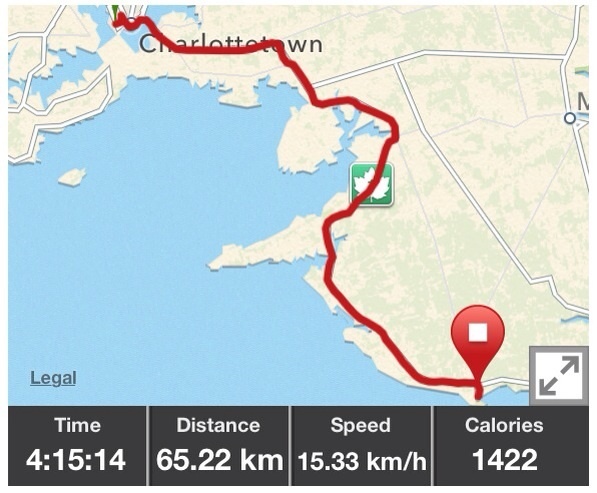 We cycled into Westboro for gelato and then along Richmond Road, where we enjoyed seeing familiar shops and restaurants. 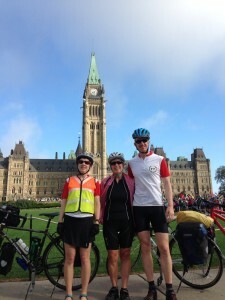 We stopped in to see Robin, with her two delightful girls, then back on the bike path to Parliament Hill and then to our hotel on O’Connor St. We will have two days off here. 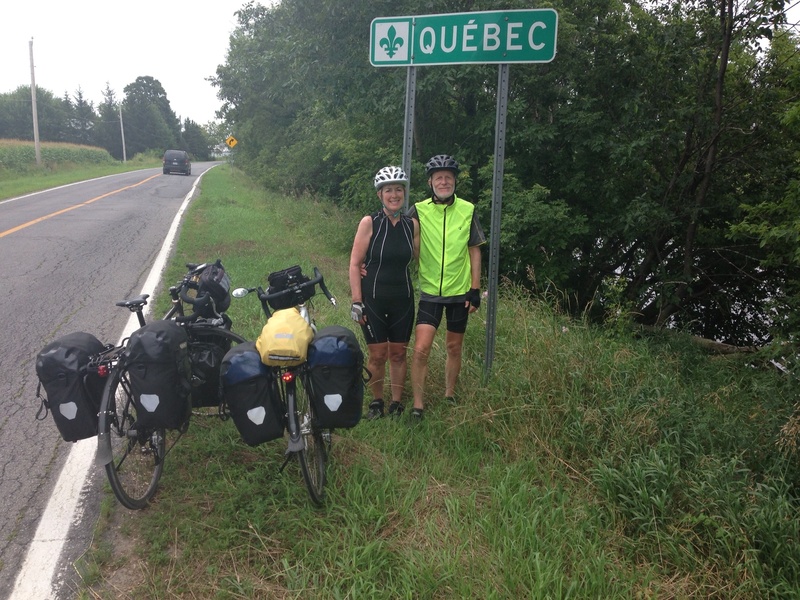 Tomorrow, we will be joined by our nephew, Marius, and his wife, Helen, who have come from England to cycle with us to Quebec City. 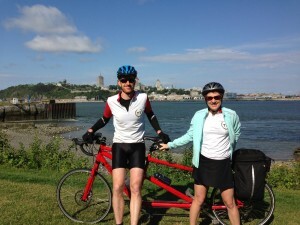 Marius and Helen are currently cycling from Montreal to Ottawa on their tandem. We are on the traditional territory of the Algonquin Nation. We are now so used to rising early that it is difficult to sleep in on a day off. It also didn’t help that someone’s motorcycle was idling outside our motel window. Although we found breakfast at 8am, we had to cycle around Perth and then wait in the park at the feet of a statue of Big Ben, Ian Miller’s championship horse, for the coffee shop, Coutts and Co., to open at 10! While having coffee, a local resident, who owns an antique furniture store here, came over to chat with us about our trip and offered us the use of his home as he and his wife were leaving on a trip to Kentucky. We told him that we were waiting to check into the Perth Manor Hotel, but very much appreciated his gesture to two complete strangers! Perth is a well preserved town with many stone buildings from the 1800’s. 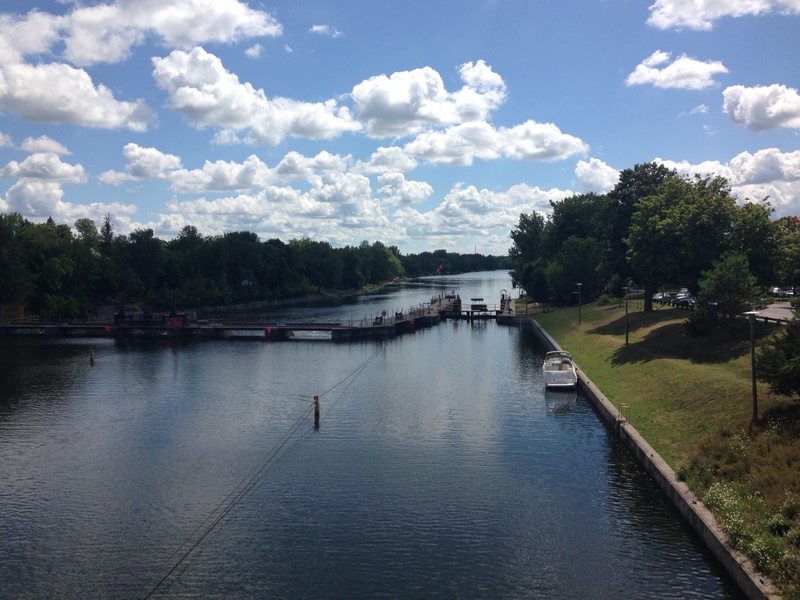 The Tay Canal starts here, which joins up with the Rideau Canal, and was important for commerce in the past. We both recall being by the locks at the other end, not far away, where there are a number of osprey nests on which Paul banded young a number of years ago. We wandered through the town looking at the historic architecture and dodging rain showers and later ate in a Mexican restaurant which overlooks the Tay River. Tomorrow we cycle to Ottawa. Breakfast was more Rui Pereira creations, starting with freshly-baked croissants, with spaghetti squash marmalade (very good!) and tomato jam (surprisingly good, as well) and banana muffins, followed by cheese and vegetable omelettes, toast and espresso/latte. Mr. Pereira helped us get our bikes out of the garage, chatted for a while about Portugal and Fado music and waved us off. We had intended to stay in Sharbot Lake, but all accomodation was booked up for the Blue Skies Music Festival in nearby Clarendon Station, so we decided to cycle directly to Perth. We learnt that in the same part of Ontario this weekend there is the Boots and Hearts Musical Festival at Mossport and also the Flinton Country Bluegrass Jamboree; lots of action! 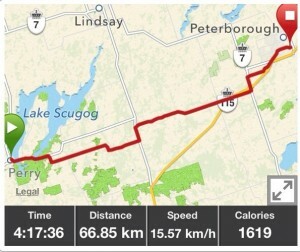 The ride was again uneventful as we cycled on the #7 through Hastings, Lennox and Addington, Frontenac and Lanark Counties. While the shoulder varied from between 10cm to 50cm, it was in good condition, the traffic was steady but not heavy, and we had a tailwind. We stopped for fries and caesar salad at the chip wagon in Kaladar. Unfortunately there are still long stretches without “facilities”. Today Lois walked into the grass at side of the road only to leap out again as she saw a garter snake. Paul accompanied her into the bush on this occasion, at her insistence. We are staying in Perth for two nights. It is slightly disorientating to be eating at a restaurant that we visited while we lived in Ottawa. 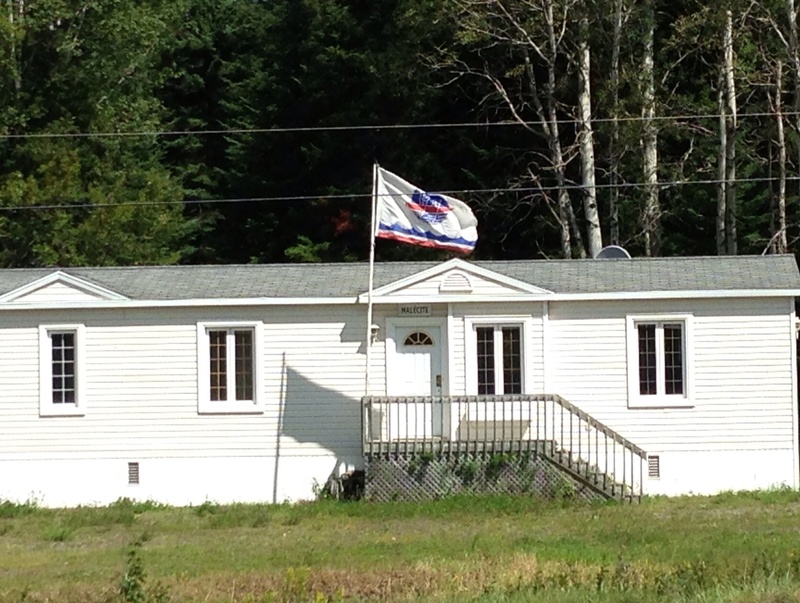 The closest First Nations community is the Ardoch Algonquin First Nation. It is worth looking at their history as yet another example of exploitation and dispossession. Although the land is the traditional territory of the First Nations of the Upper Canada Treaties Area 1, the Ardoch First Nation is non-status. 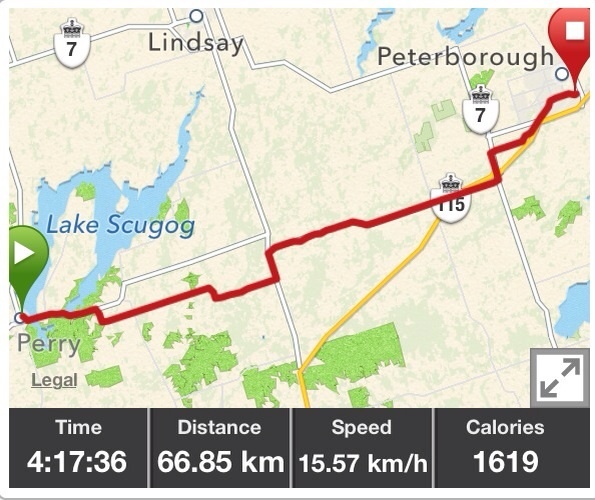 After all the hills yesterday, we decided to go back onto Highway 7 (this route is also designated as the TransCanada for central Ontario). In fact, it was fine (or maybe we’re just getting more used to negotiating narrow shoulders). The traffic wasn’t too bad and the wind was behind us. 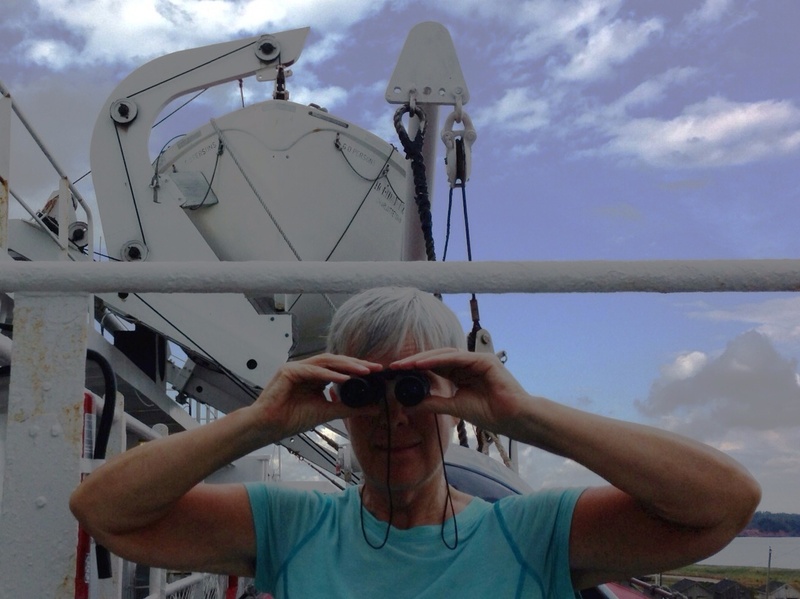 Maritia sent us a text while we were taking a break in Havelock, to say that it was raining in Vancouver for the first time in a month. We called and had a video chat with all of the family as they were on their way to work/ day care. We are staying in Marmora. 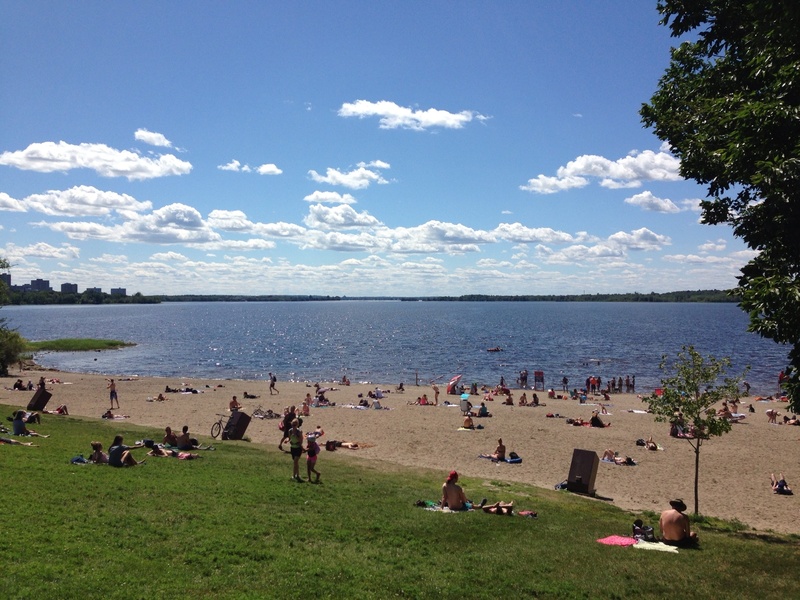 The name comes from the Latin for marble, relating to a large rock in nearby Crowe Lake. After 1820, the township was important for iron ore mining. 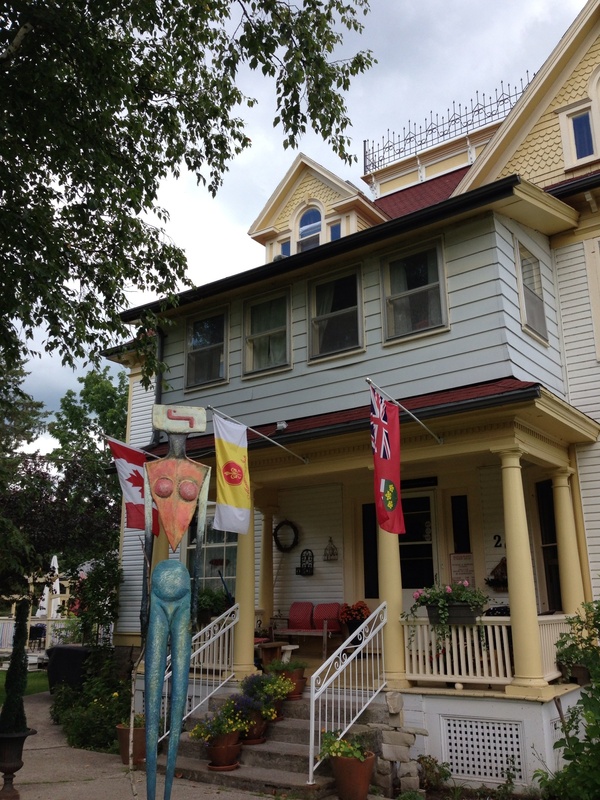 The Marmora Inn is a beautiful Victorian house filled with antiques and a great deal of art. In the dining room alone, were several signed Slvador Dali lithographs and a painting by Canadian William Ronald, among others. The Inn has a reputation for good food, and we were not disappointed. The owner, Rui Pereira, who is also the chef, served up interesting salads and mouth -watering plates of sea bass – grilled filets with plum chutney/whole charred fish with capers – followed by chocolate mousse and creme brûlée. We are already looking forward to breakfast! 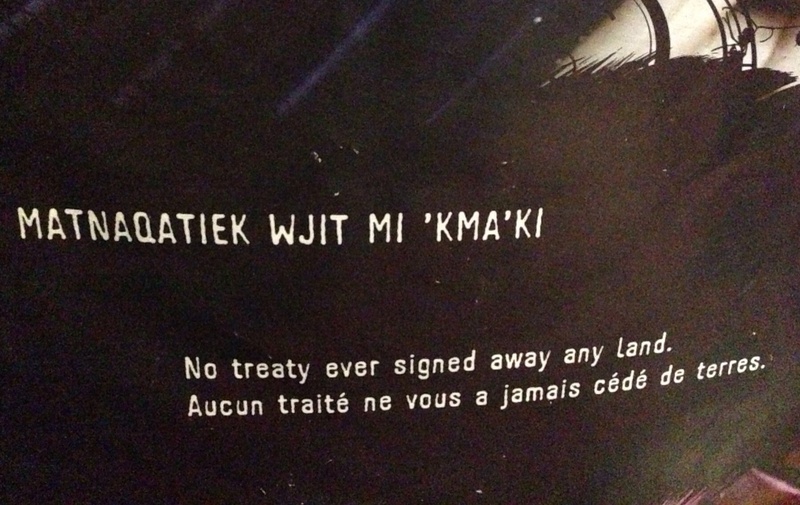 We remain on the traditional territory of the First Nations of the Upper Canada Treaties Area 1. Today, we spent a lot of time and effort avoiding busy highways with diminutive shoulders. The alternative was peaceful countryside, but many steep hills. On one particularly steep hill, Paul walked back to provide moral support to Lois (not an unusual occurrence) to find her with her biked parked beside the highway, picking wild raspberries! 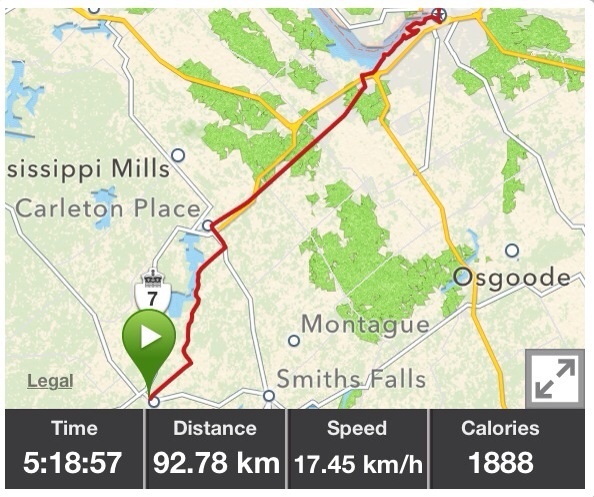 When we eventually returned to Highway 7A, it was OK and, apart from the absence of hard ice cream, the Garmin led us successfully into Peterborough across the Severn Trent Waterway to our hotel. We have a room overlooking a creek flowing into the Otonabee River. 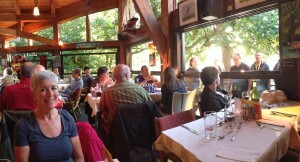 Our meal at the Electric City Gardens was delightful. Wildlife Notes: Snapping Turtle crossing the road. 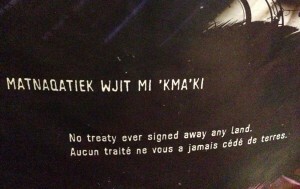 We are still on the traditional territory of the First Nations of the Upper Canada Treaties Area 1. 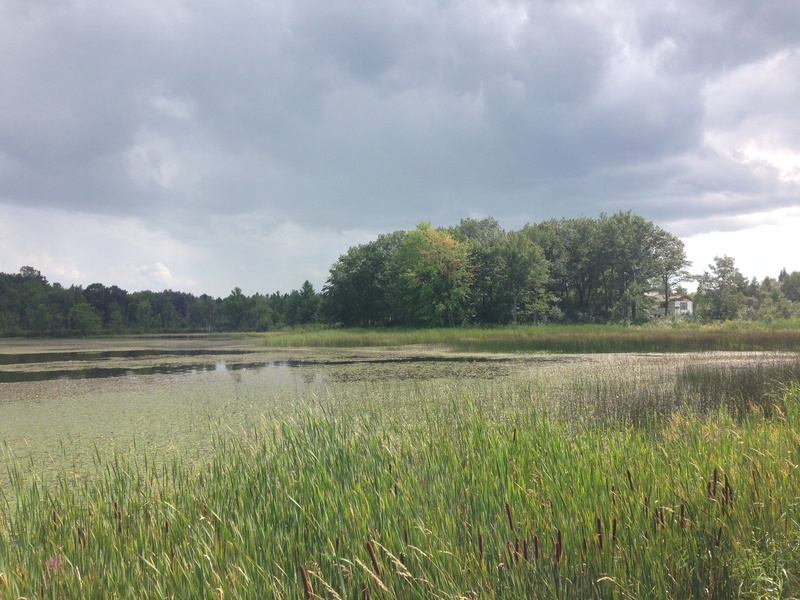 The closest communities to Peterborough are the Curve Lake and Hiawatha First Nations.